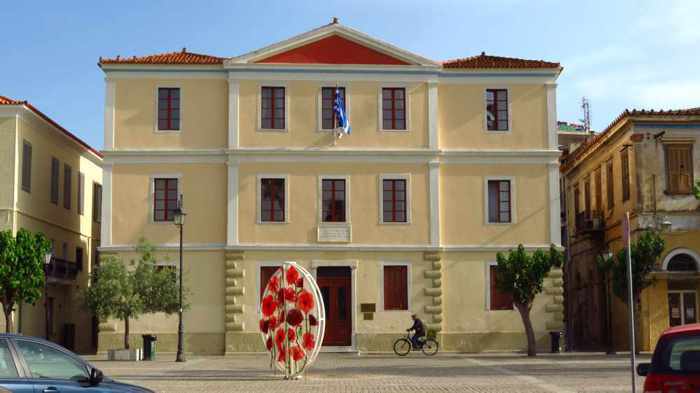 The monument to the Philhellenes in Philellinon Square. 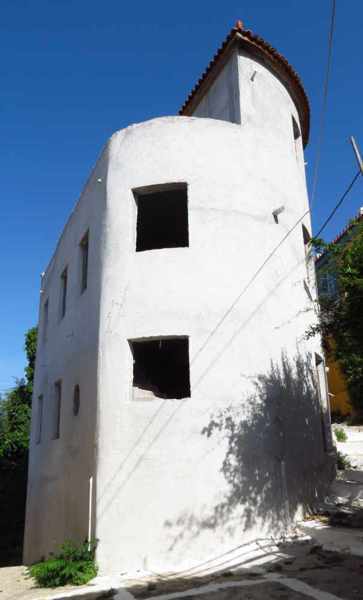 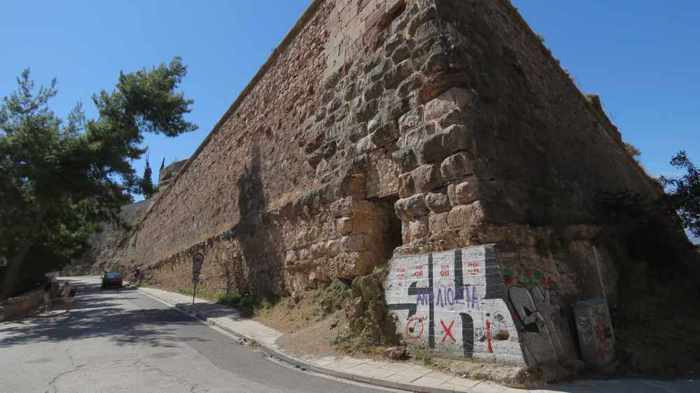 The Venetian bastion of Santa Teresa occupied the site until its demolition in 1866. 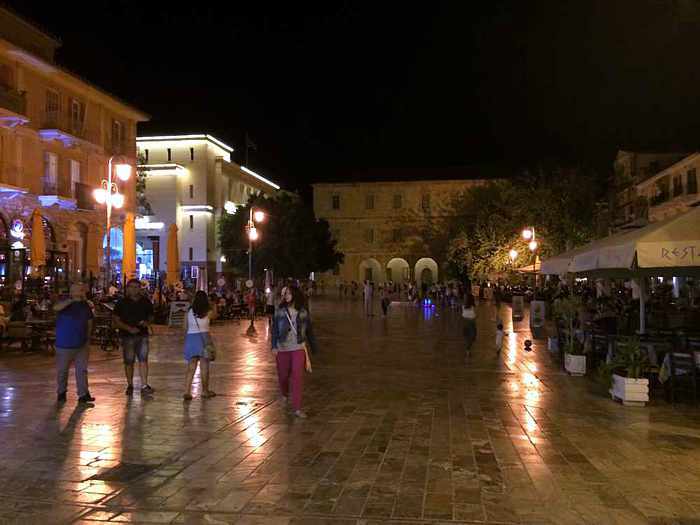 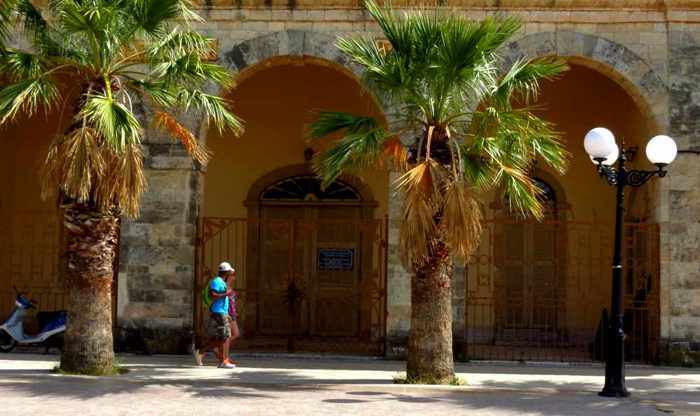 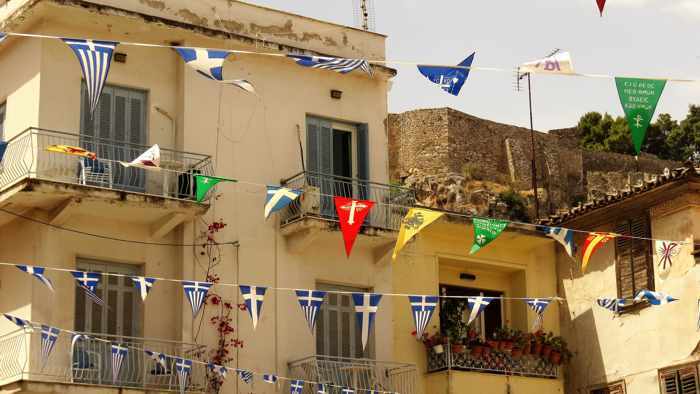 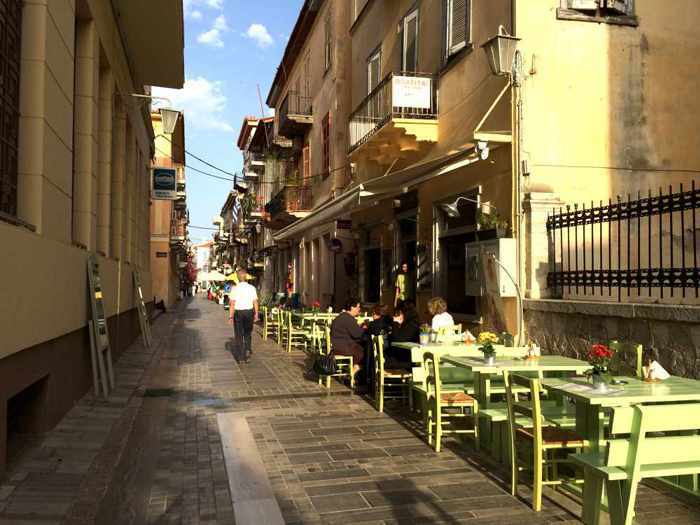 Syndagma Square is lined with cafes and tavernas and is a popular gathering place for locals and visitors alike. 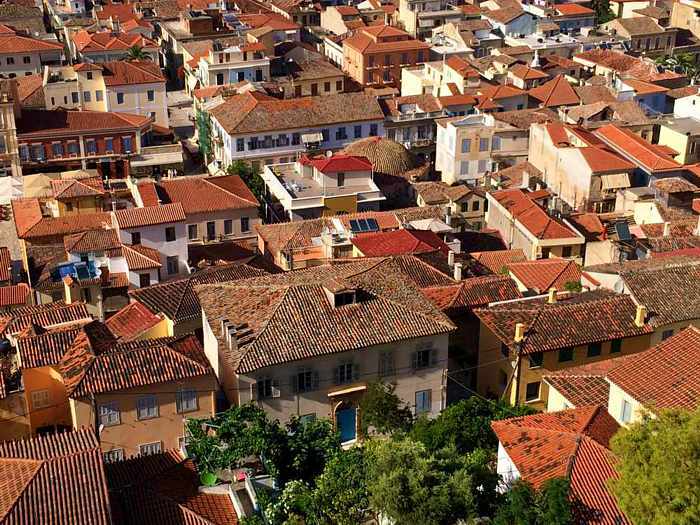 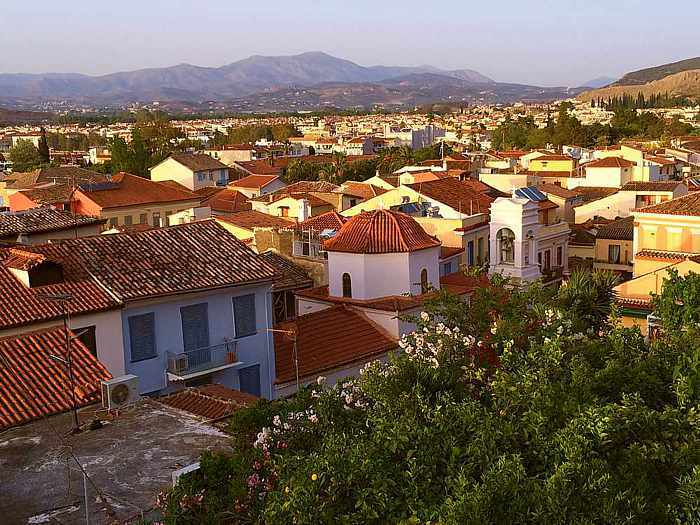 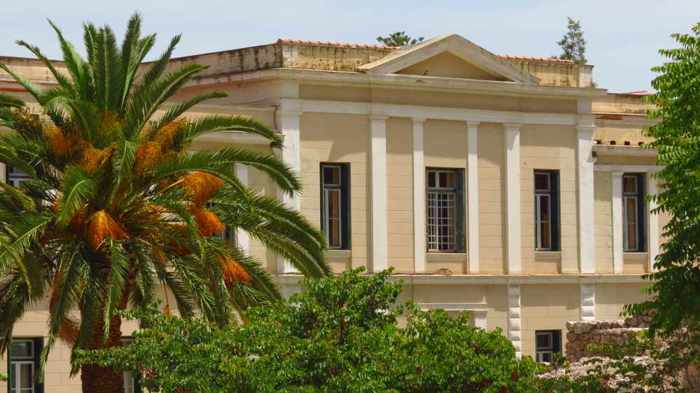 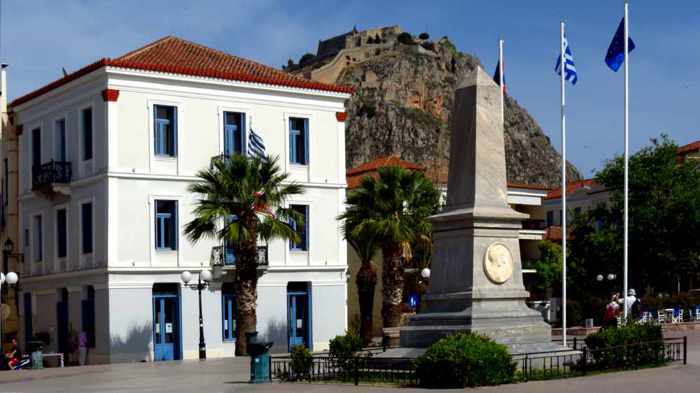 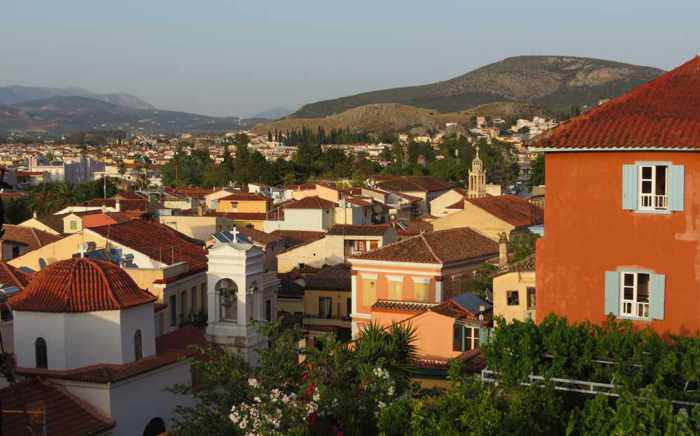 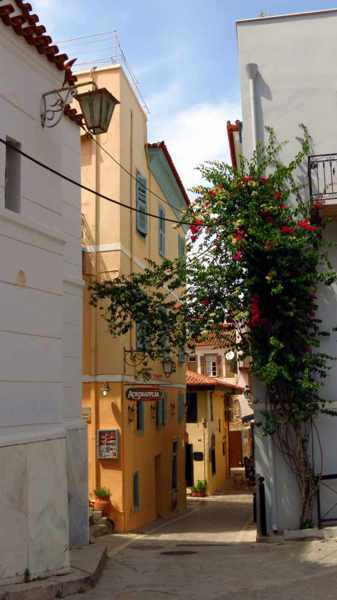 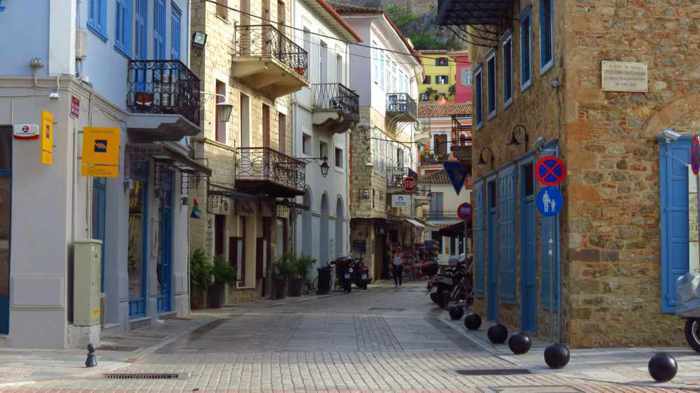 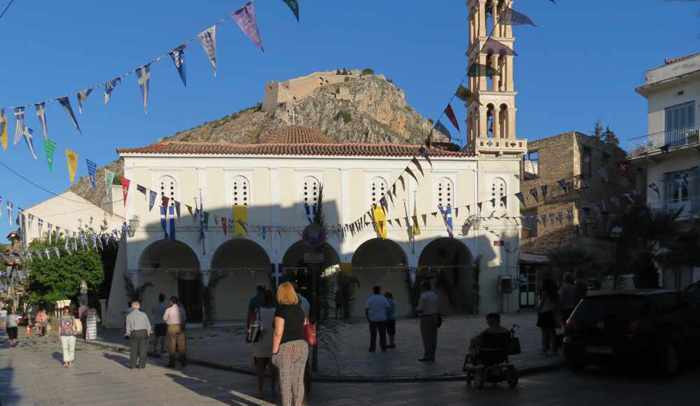 The building at the far end of the square is the Nafplio Archaeological Museum. 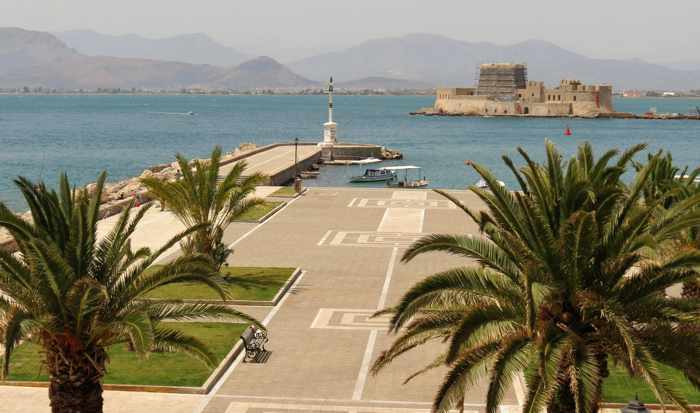 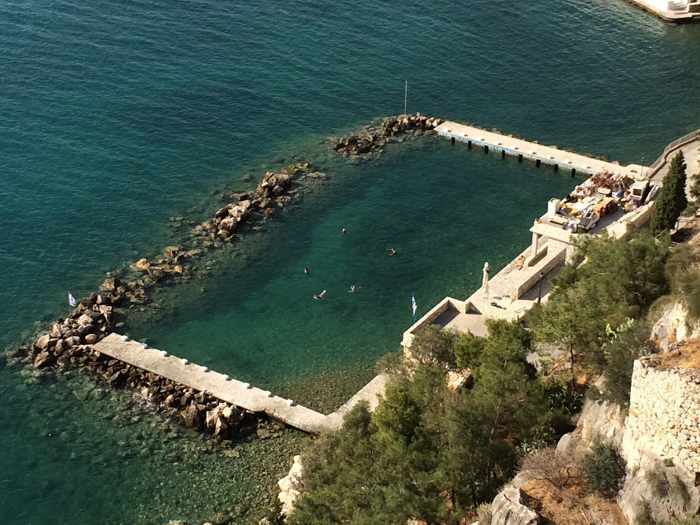 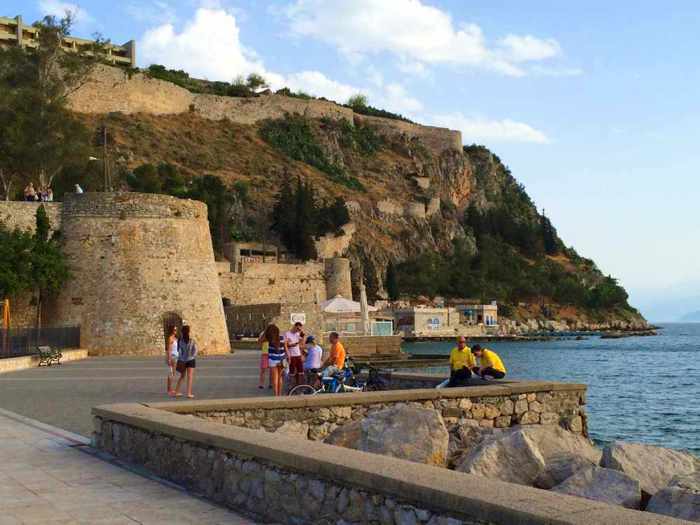 An Acronauplia fortress view of the Bourtzi sea castle, the Banieres swimming area, and the Nafplio waterfront park called The Shore. 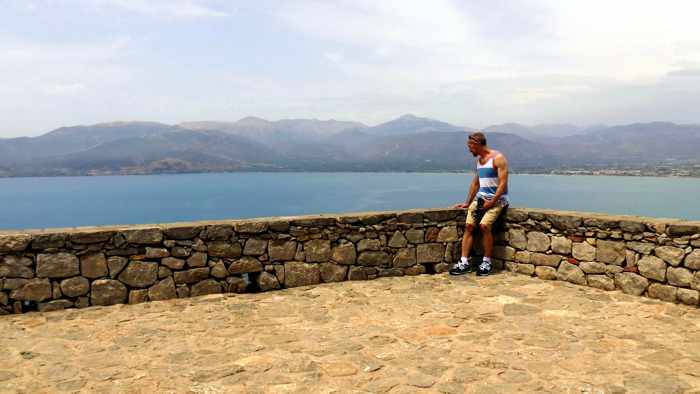 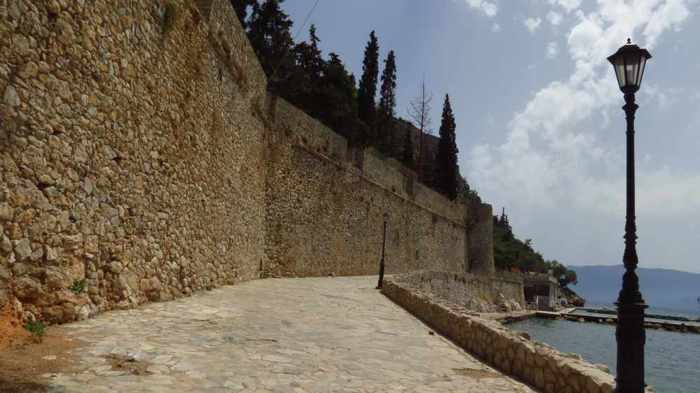 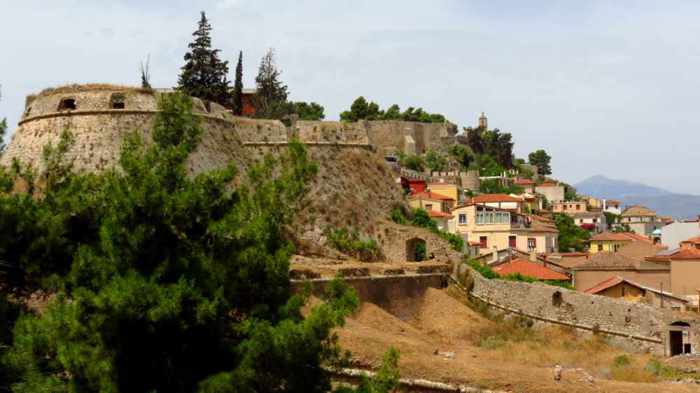 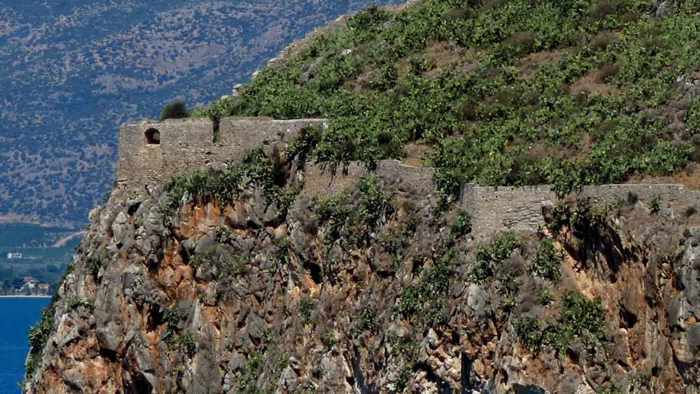 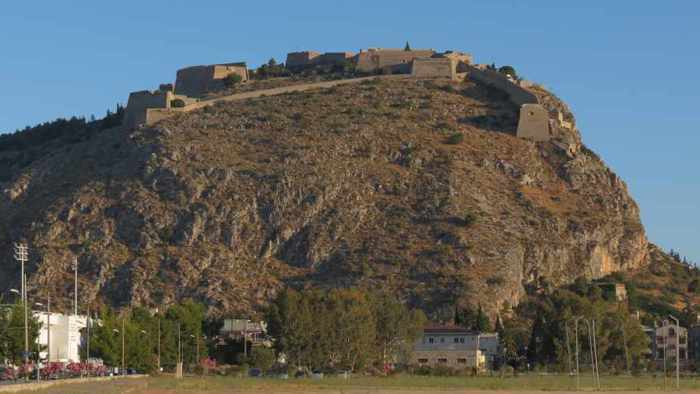 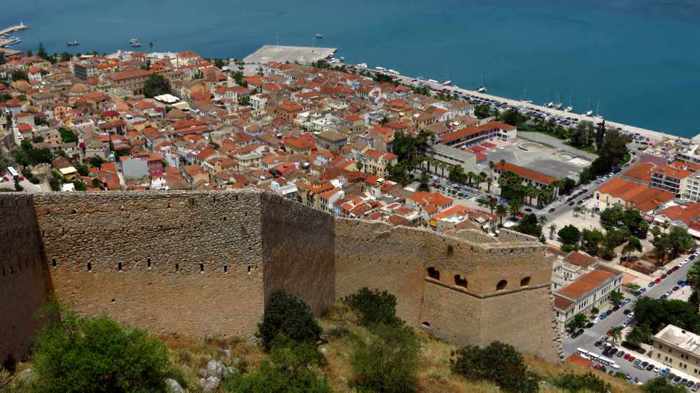 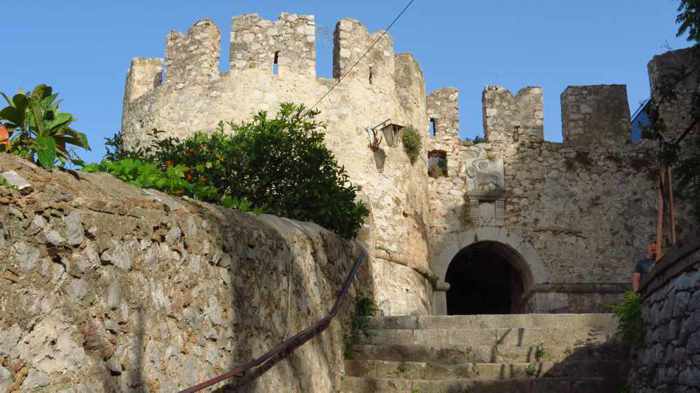 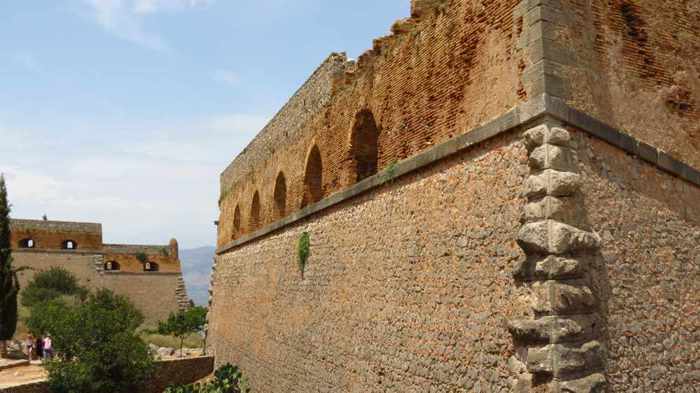 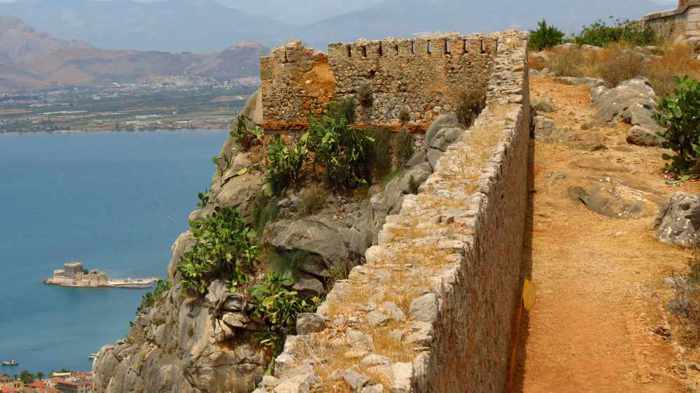 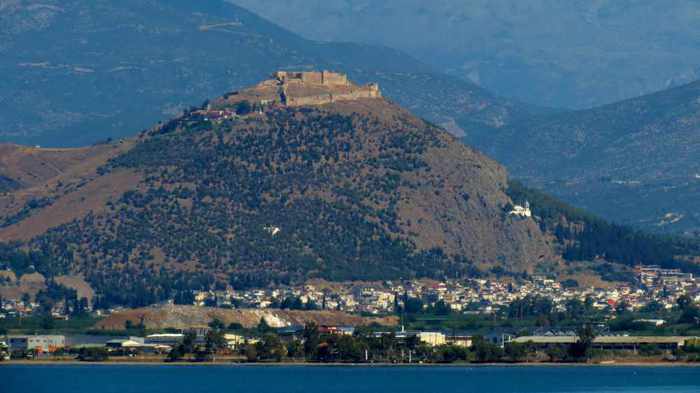 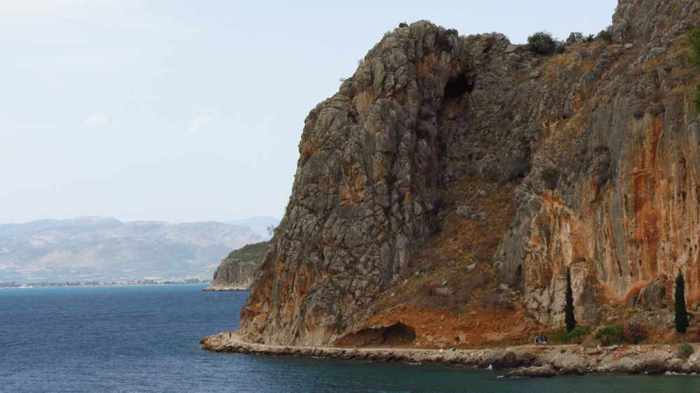 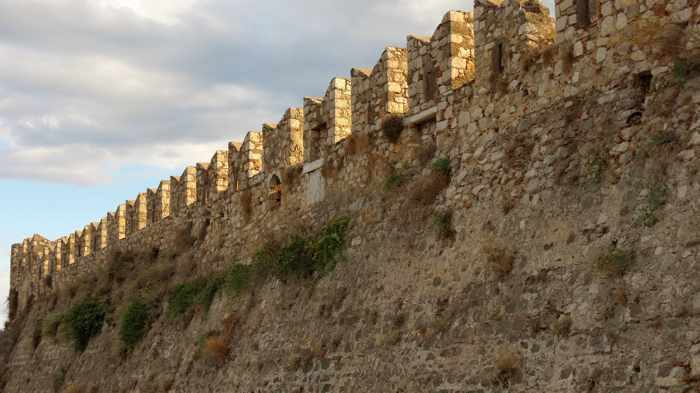 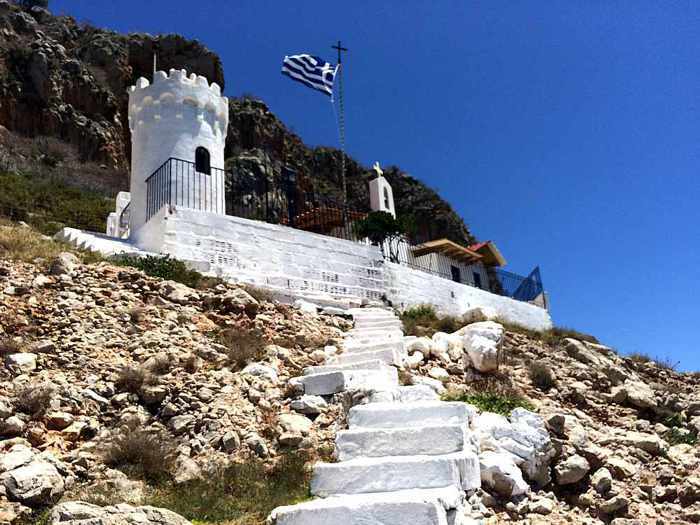 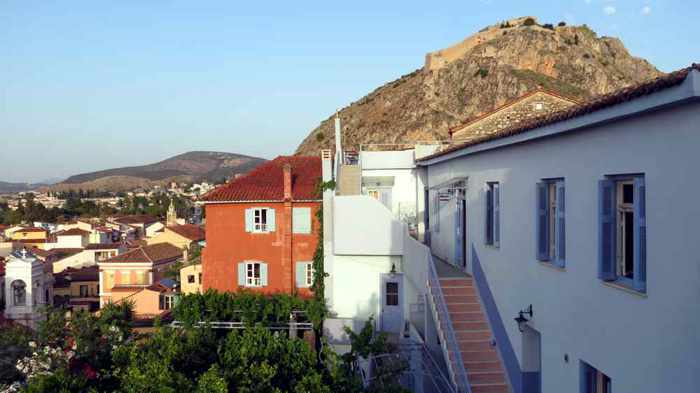 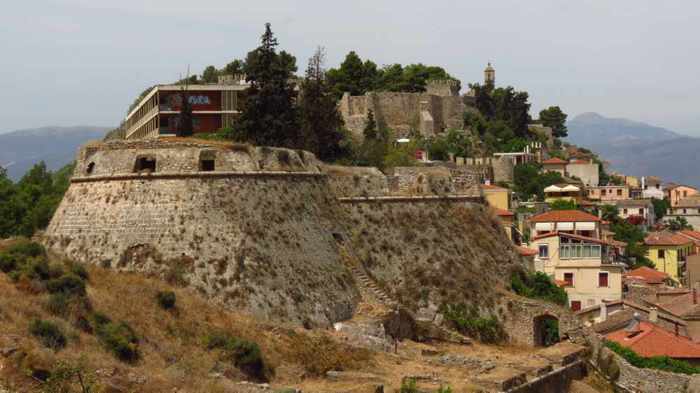 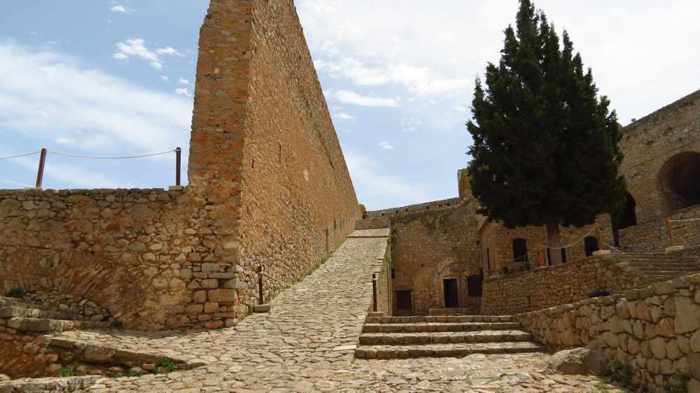 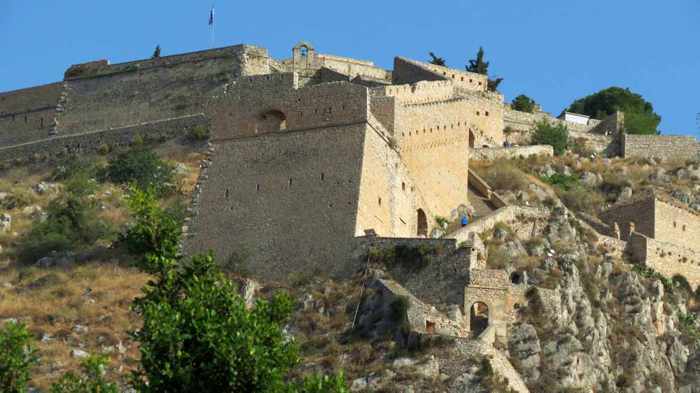 From many places in Nafplio you will see the massive Palamidi castle, which crowns the steep rocky peak behind the town. 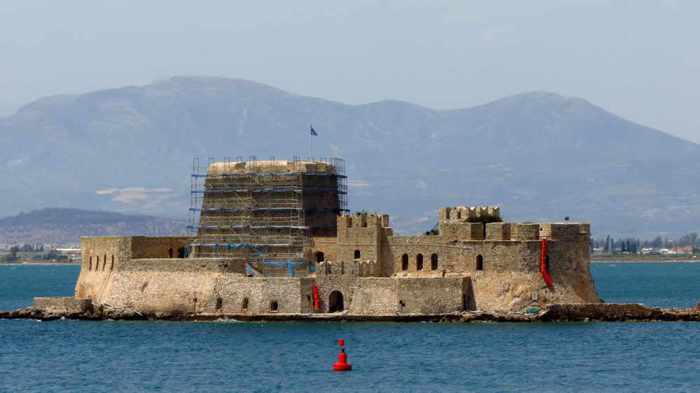 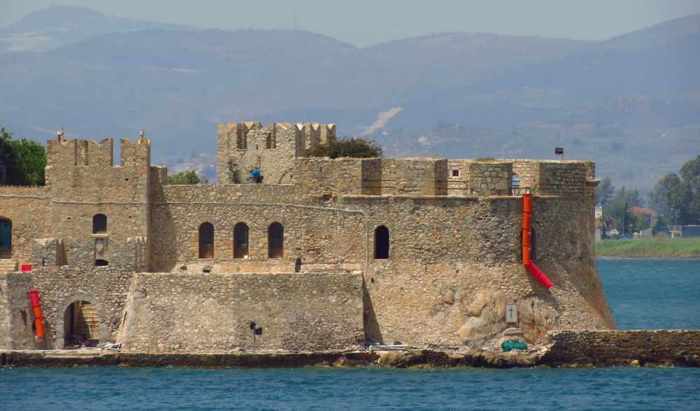 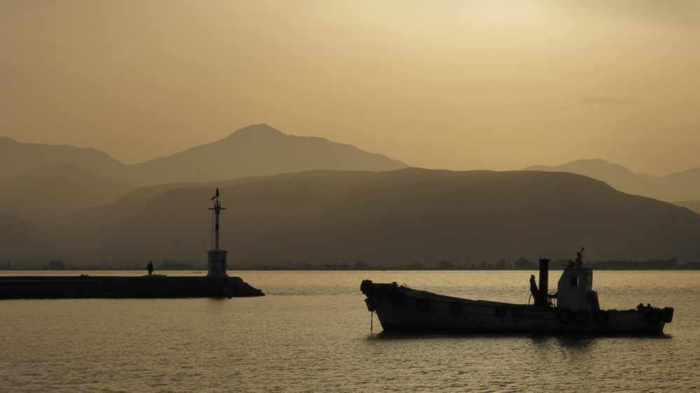 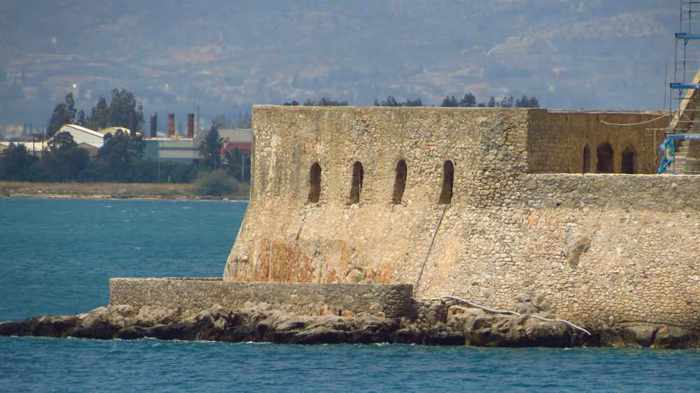 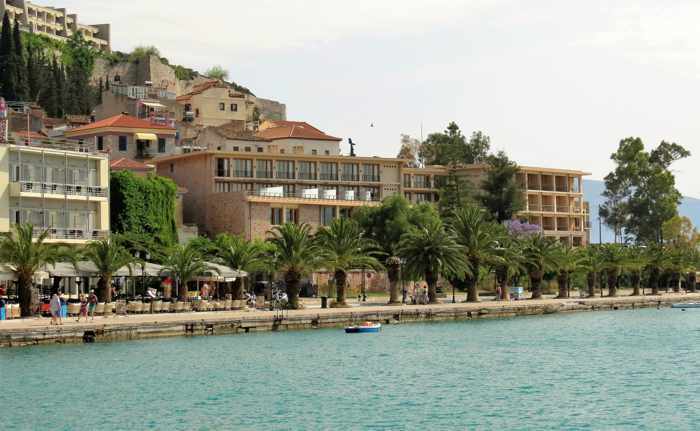 This particular part of the waterfront is known locally as The Shore, and has terrific views of the Bourtzi sea castle. 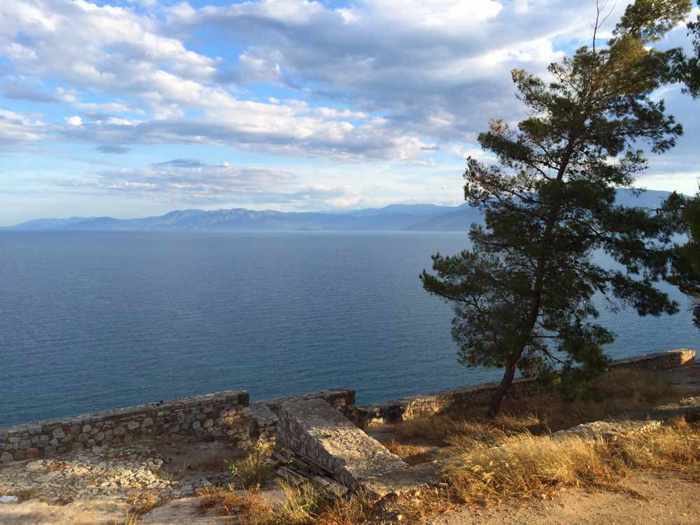 It’s a great spot for sunset watching, too. 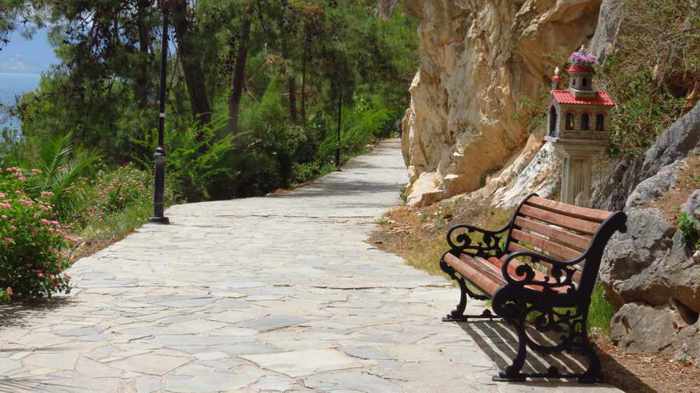 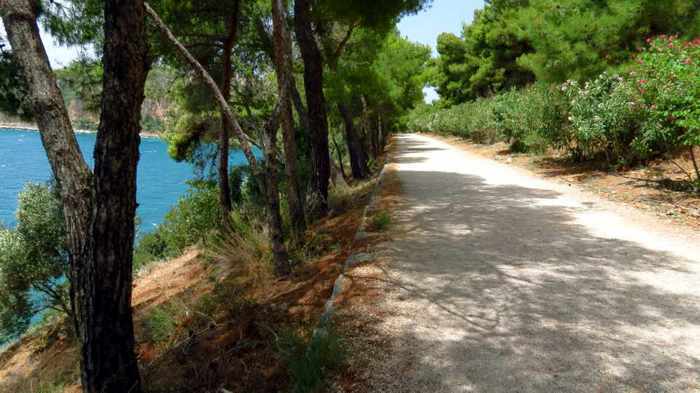 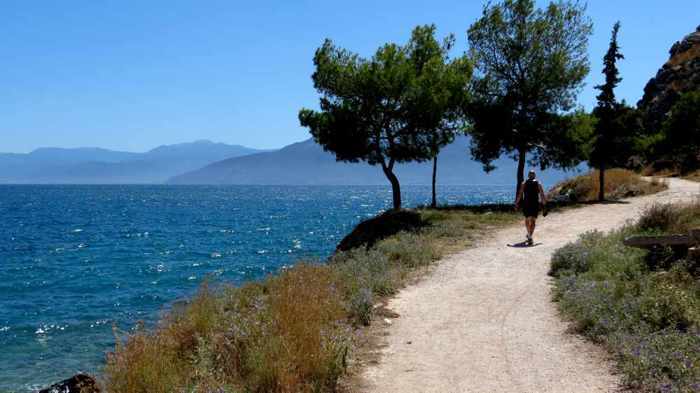 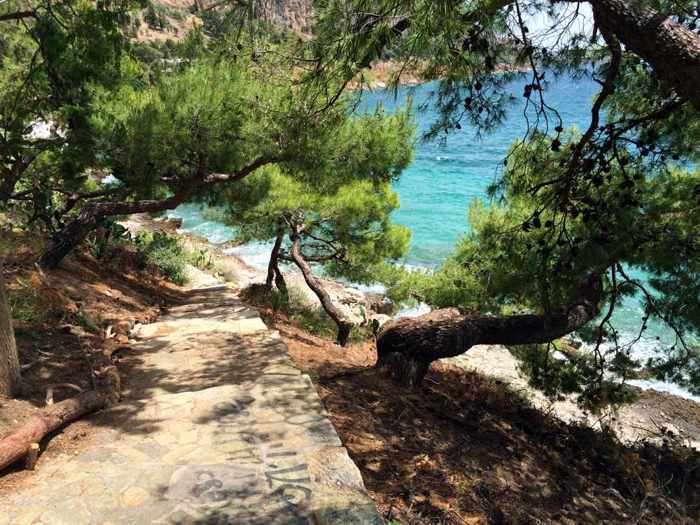 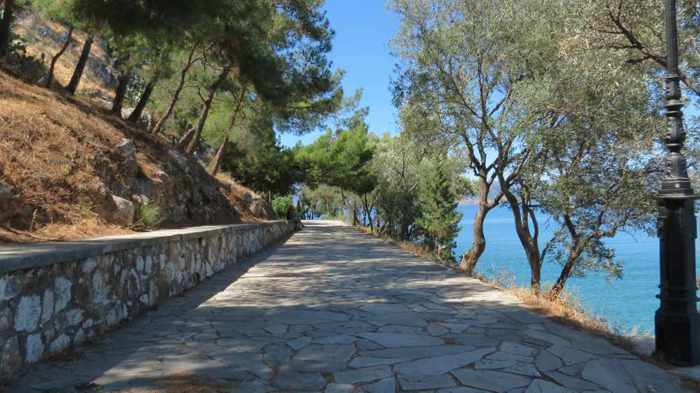 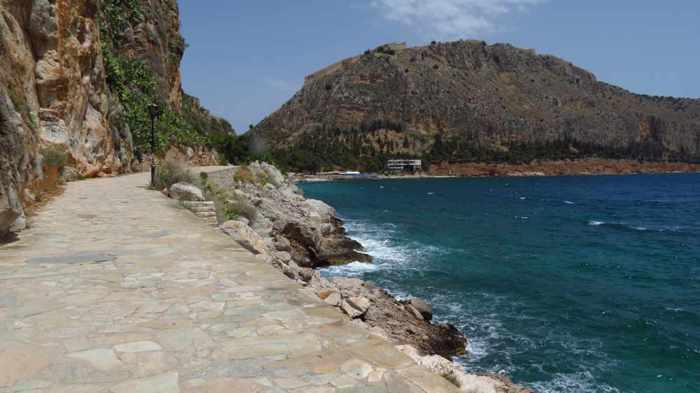 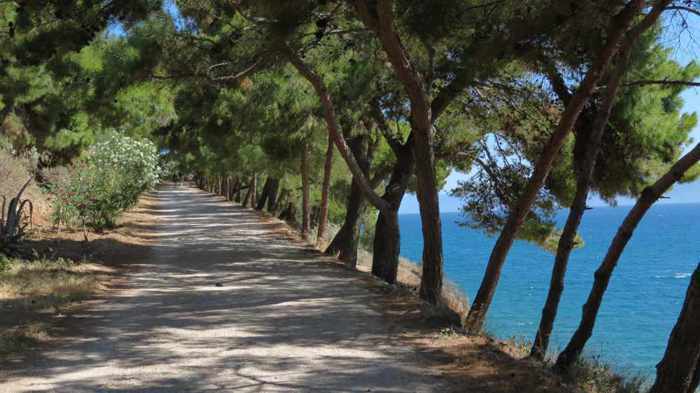 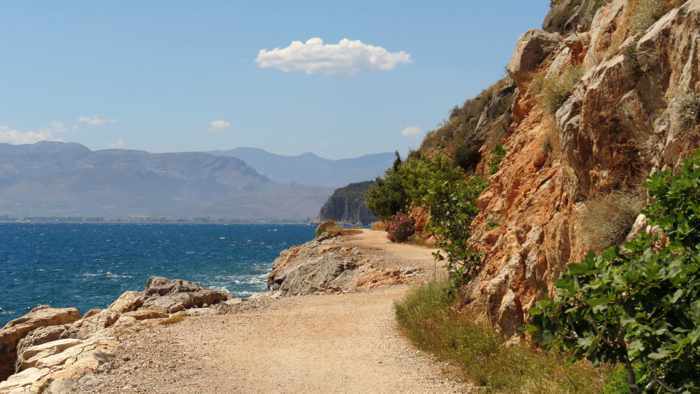 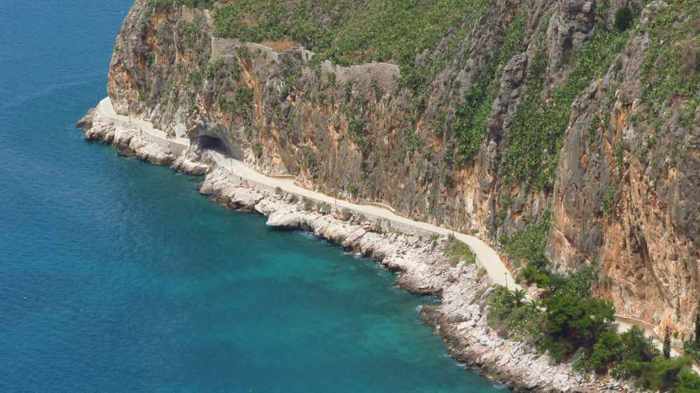 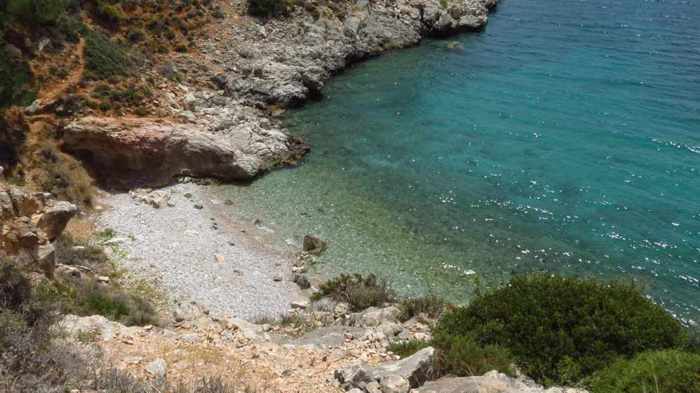 The path is popular with joggers and people heading to Neraki beach or one of several quiet coves between Neraki and Karathona. 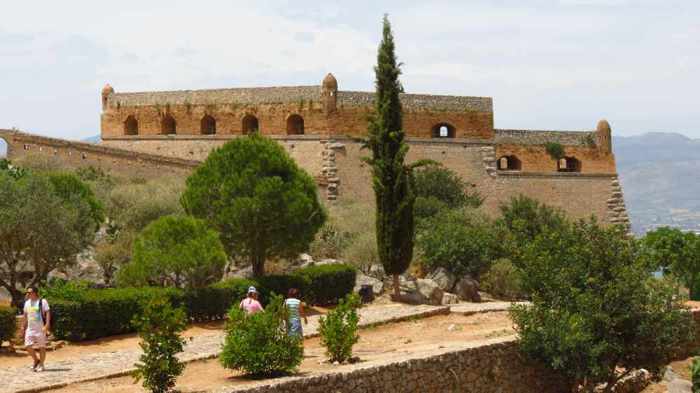 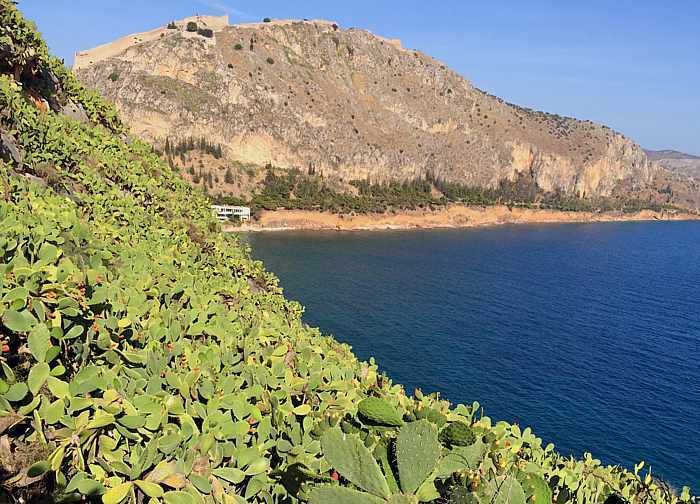 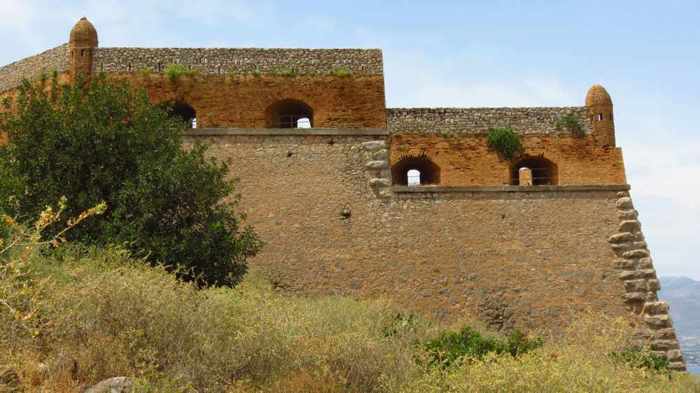 Vast thickets of prickly pear cactus cover many of the slopes of the peninsula below the Acronauplia fortress. 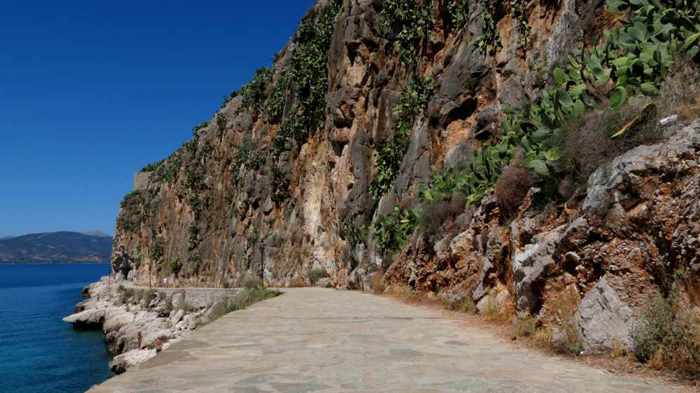 We had never seen such extensive, wide swaths of cactus before. 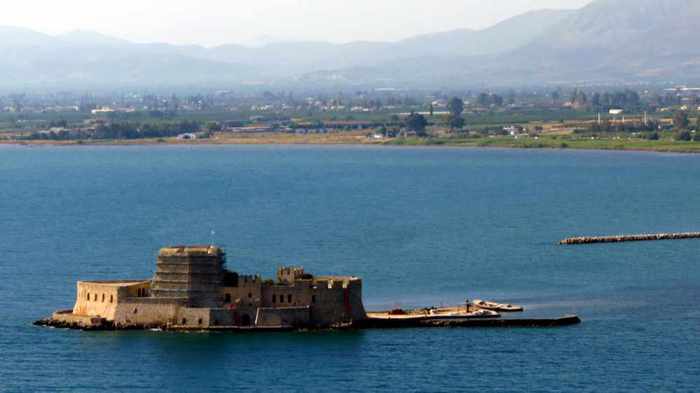 Tourists can visit the Bourtzi castle by taking a shuttle boat from the waterfront (the fare cost about €5 per person). 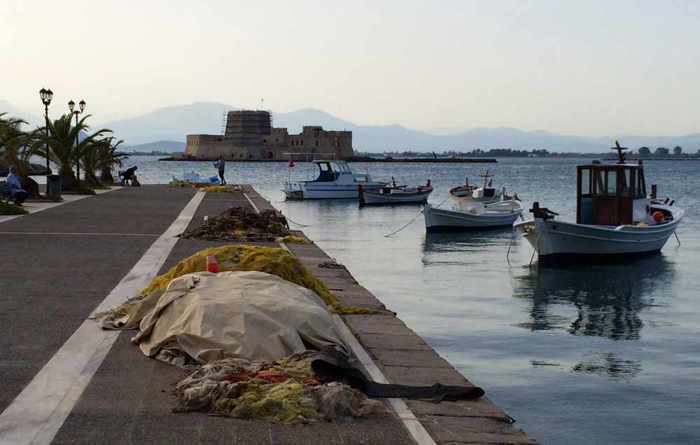 We were never around in time to catch one of the boats, so we don’t have any close-up photos to show what it’s like on the islet or inside Bourtzi. 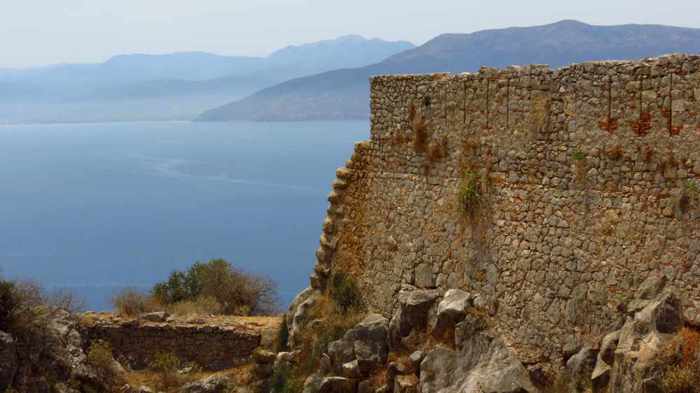 But this drone video, by YouTube contributor haanity, gives some interesting aerial views of Bourtzi, as well as the Palamidi and Acronauplia castles. 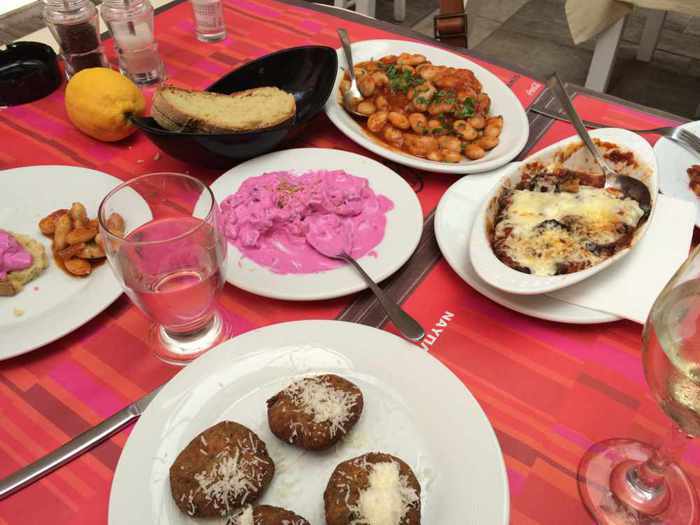 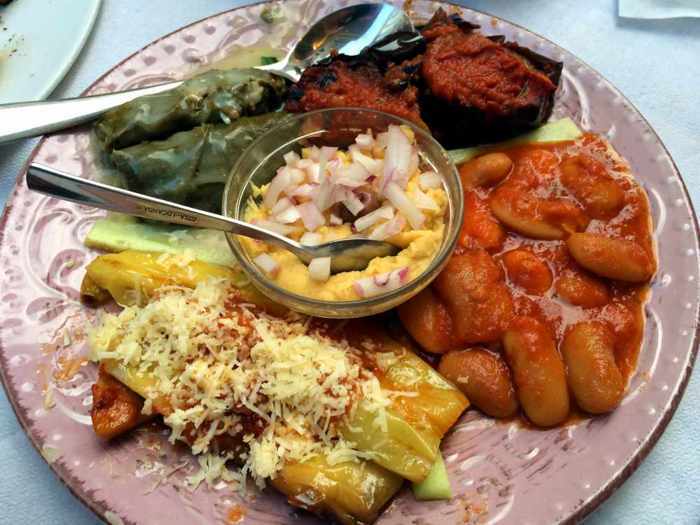 Our delicious lunch mezes at Kakanarakis 1986 restaurant included grilled bread, gigantes (giant beans), oven roasted aubergines, zucchini fritters, beetroot salad and white wine. 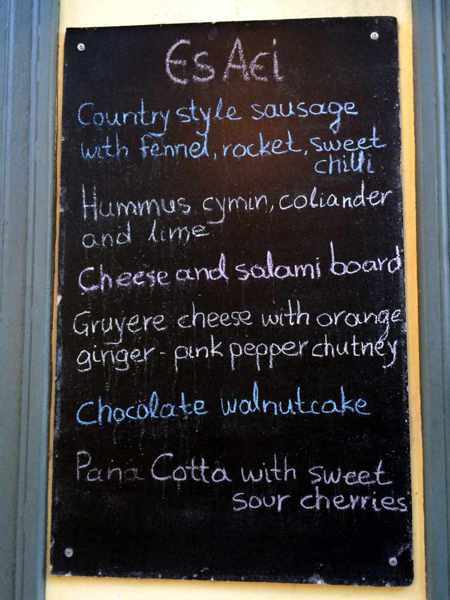 The menu board at Es Aei the evening of my birthday dinner. 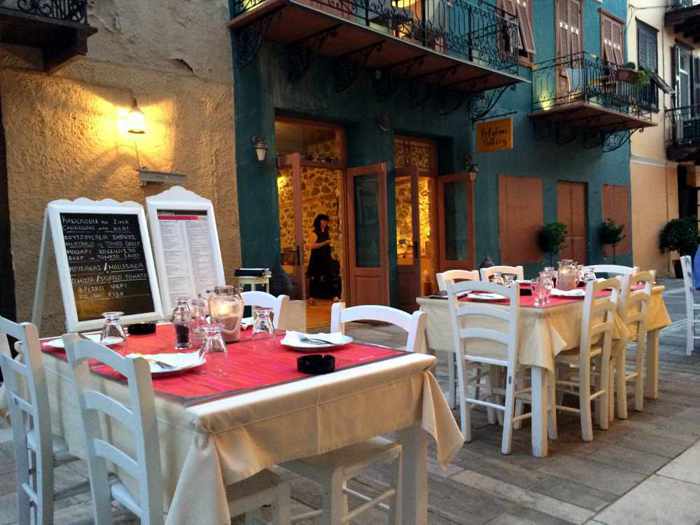 We ordered the sausage, hummus, gruyere cheese and cake, and all were delicious. 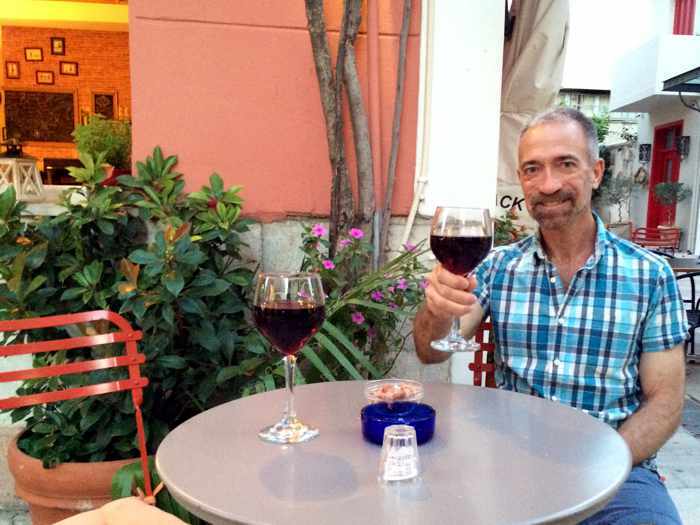 The wine was excellent, too. 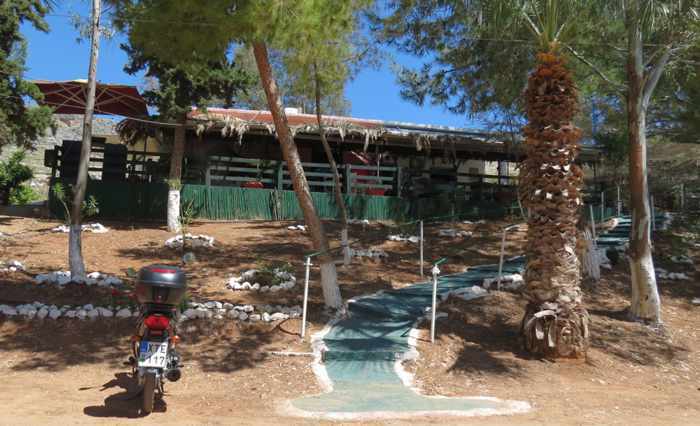 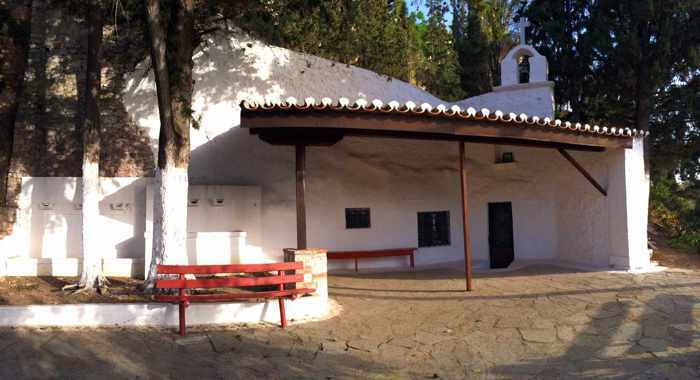 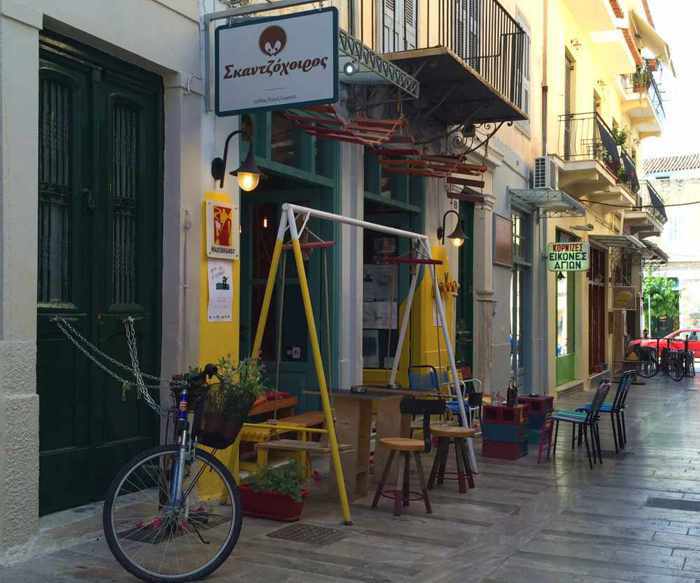 We had one lunch and one dinner at Kakanarakis 1986, see here. 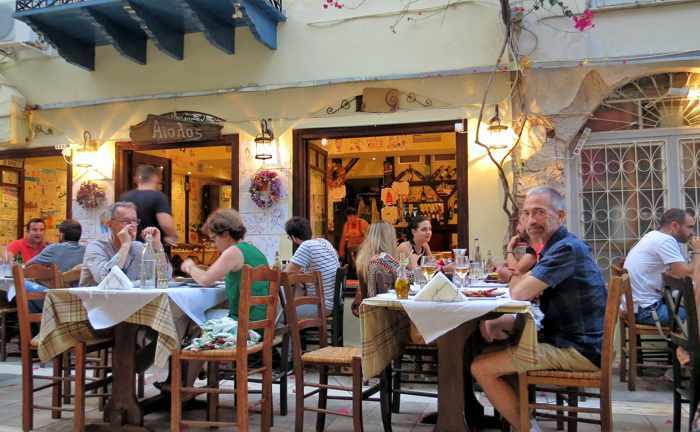 Both meals were excellent. 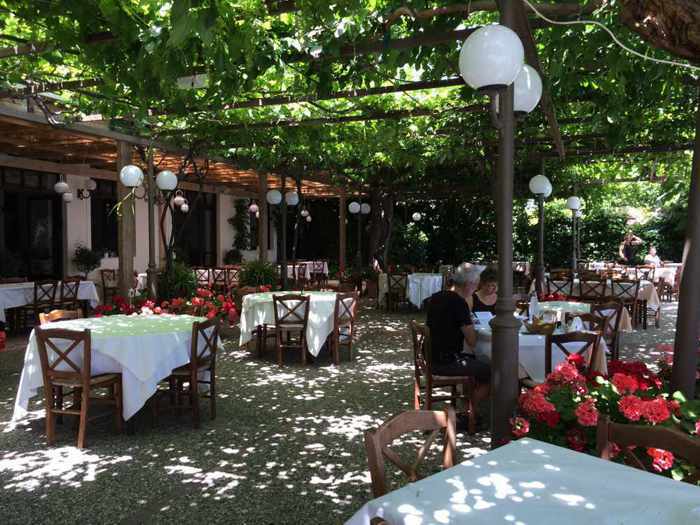 Evening sunshine illuminates the tables outside Mitato grillhouse. 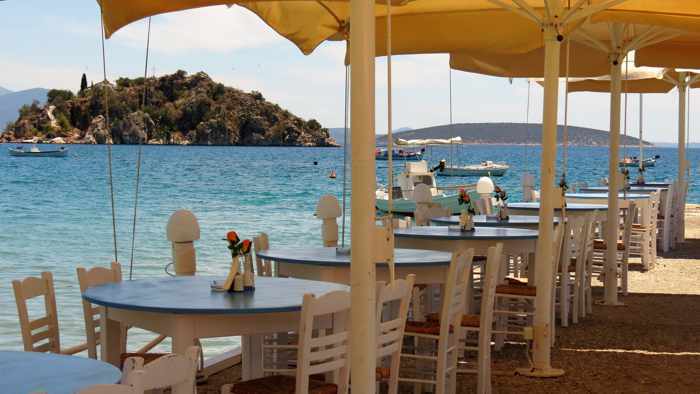 You just can’t beat this place for tasty Greek “fast food” fare like gyros and souvlaki. 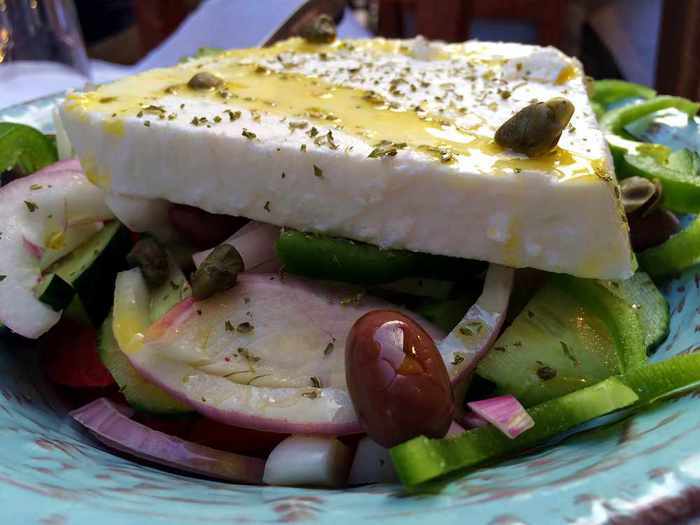 We liked the Mitato gyros so much we went back for more a second time. 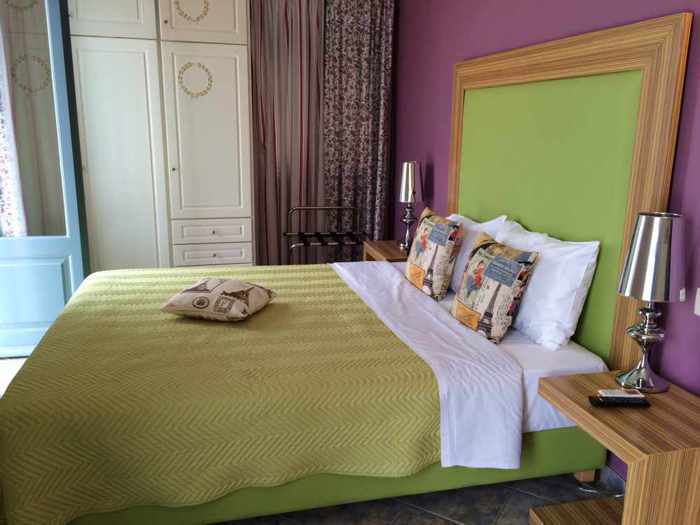 Bedroom section of the Paris suite. 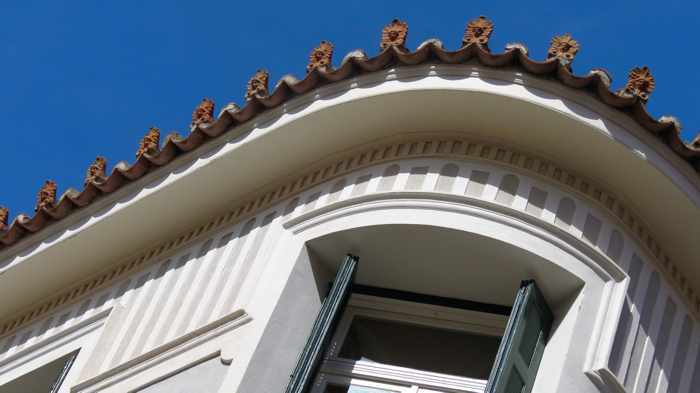 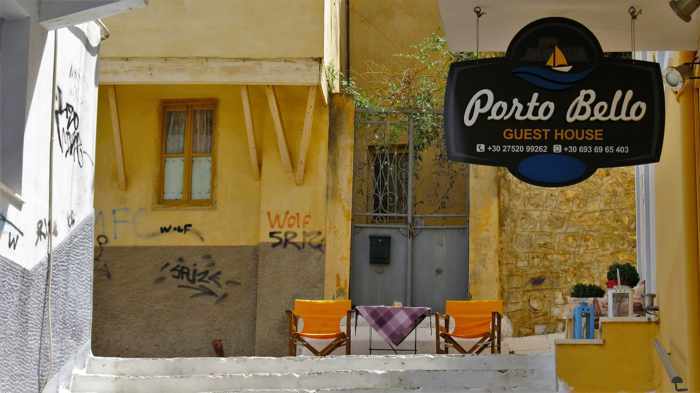 You can view more photos of the room interior on the Porto Bello Design Hotel website. 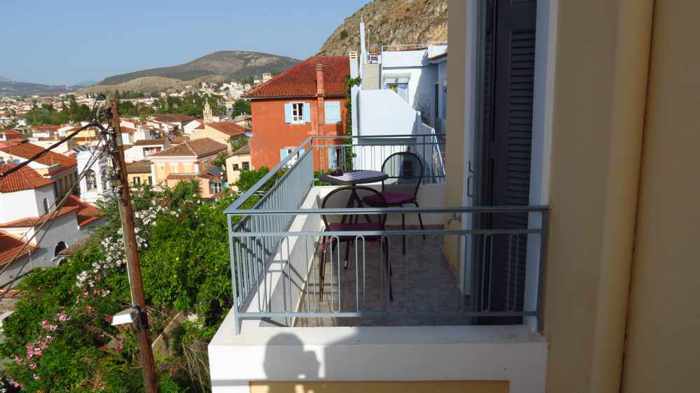 The Paris suite has two balconies. 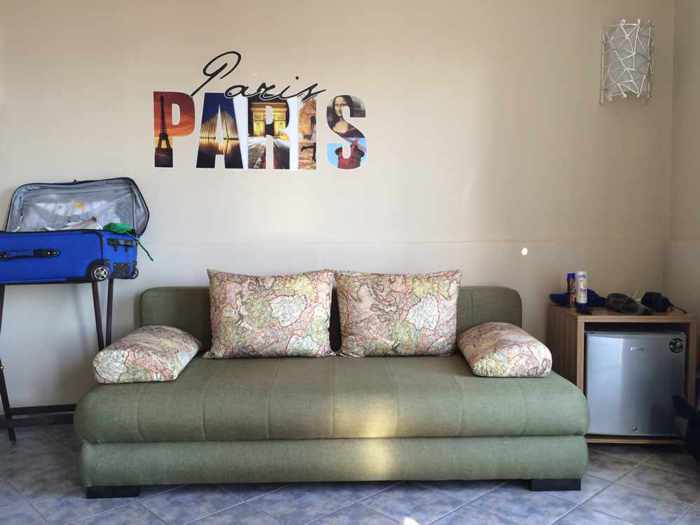 This one was next to the room’s main space. 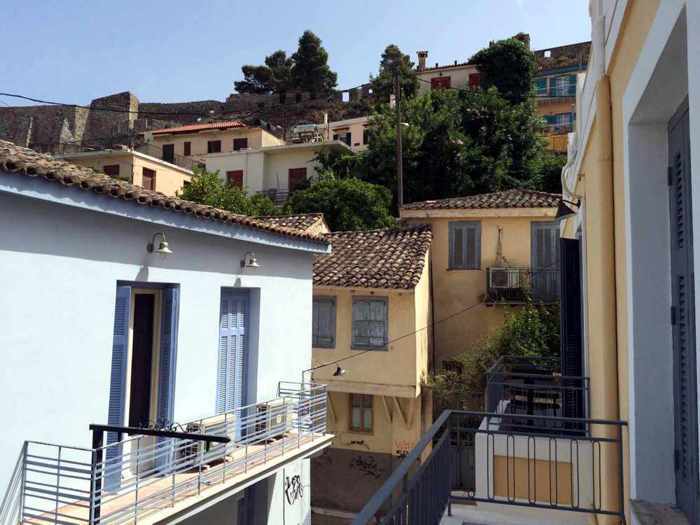 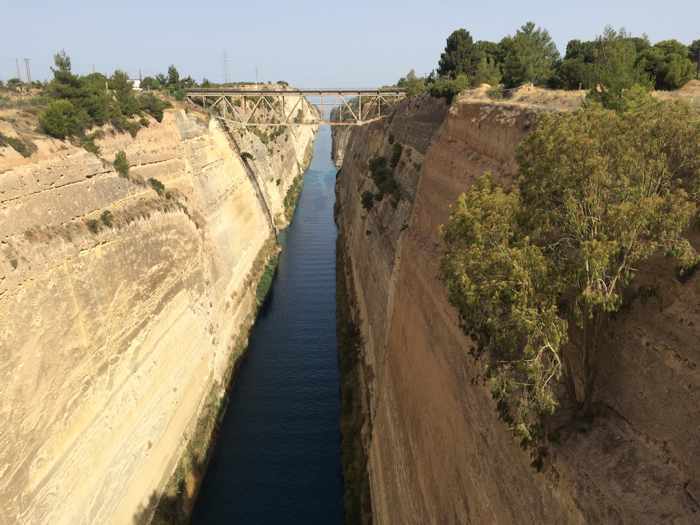 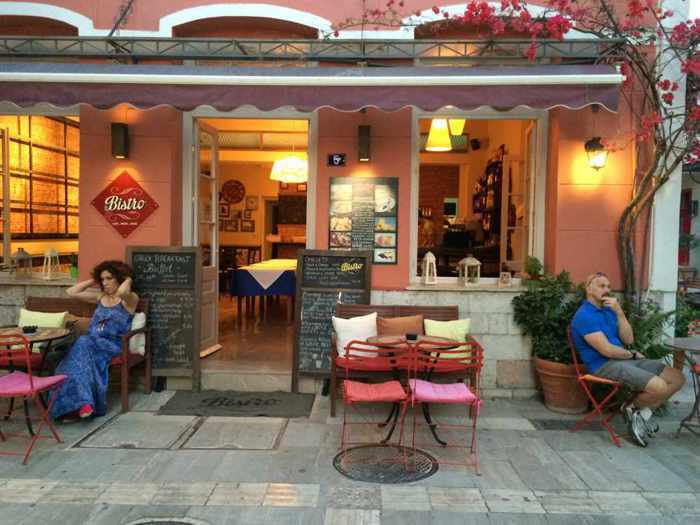 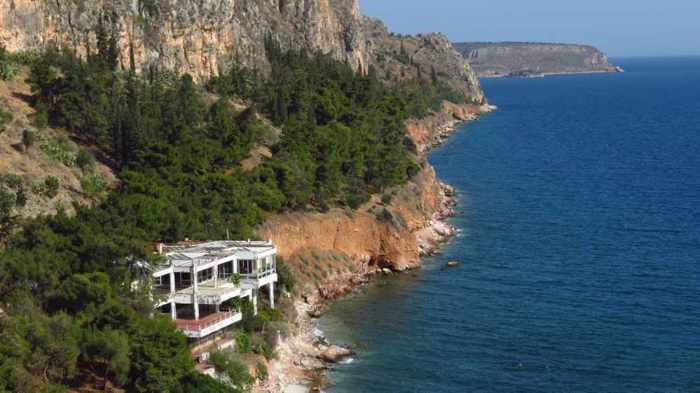 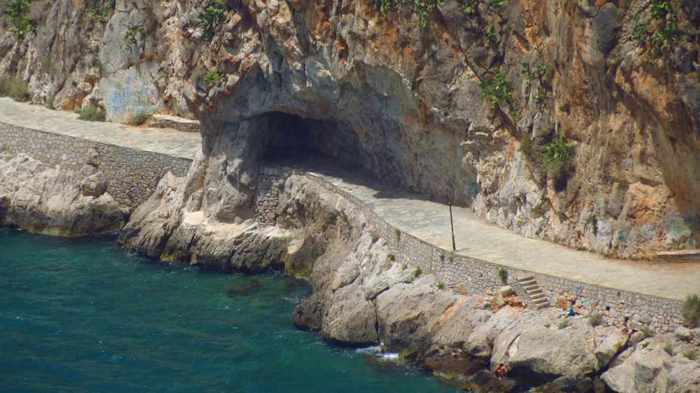 Besides the terrific views and comfortable accommodations, the Porto Bello served a bountiful breakfast that included spinach pies and other pastries, Greek yogurt, fresh fruit, hard-boiled eggs, toast, coffee and fresh orange juice. 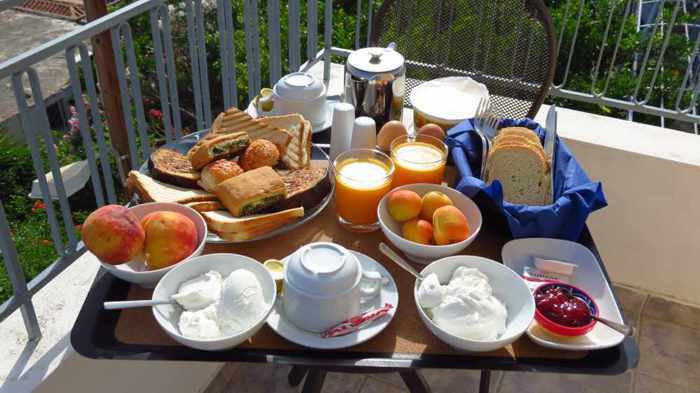 Breakfast was delivered to our room for us to enjoy either on the balcony or inside. 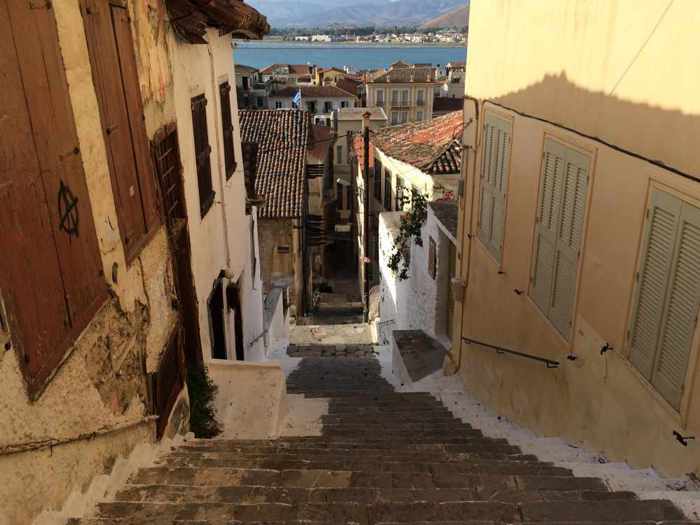 Although the breakfasts were enormous, climbing all the steep steps to and from the hotel easily burned off the calories! 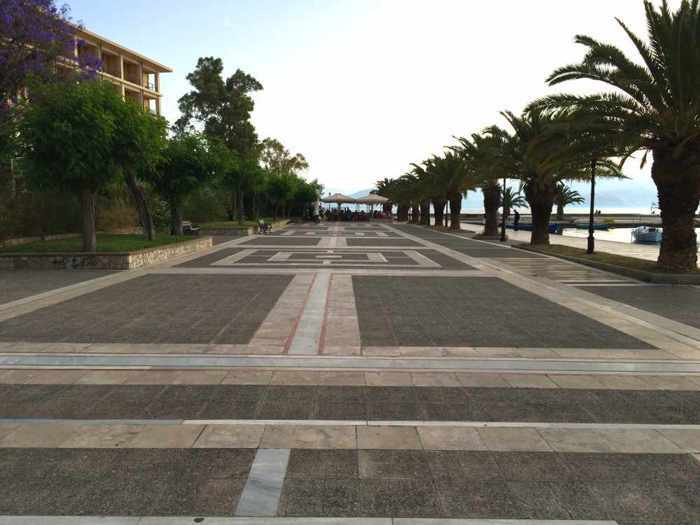 … as well as an athletics area. 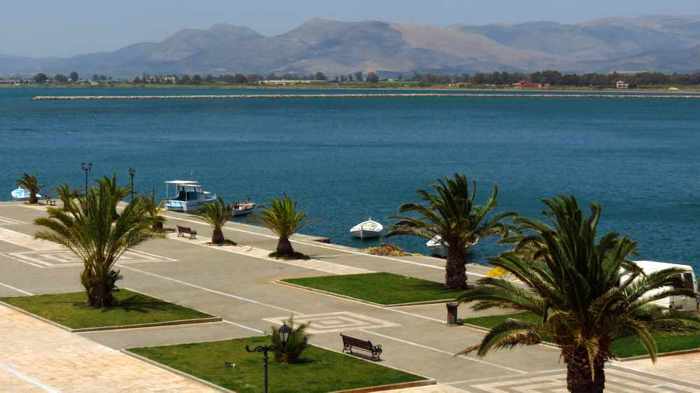 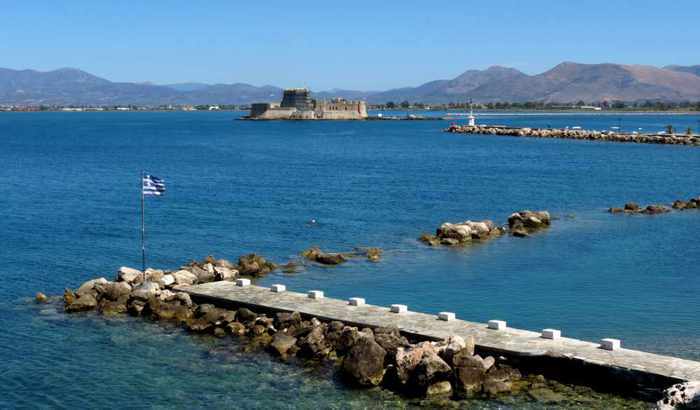 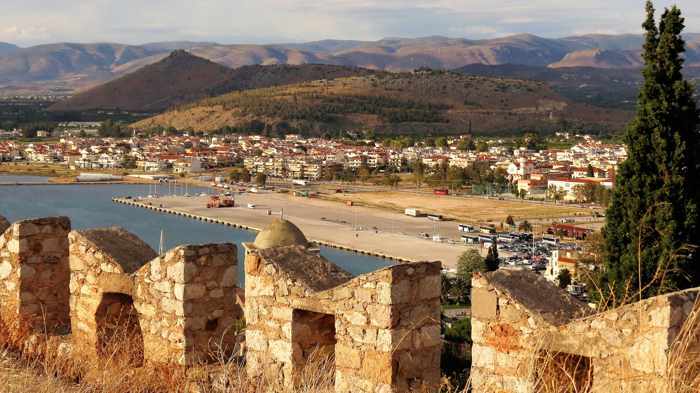 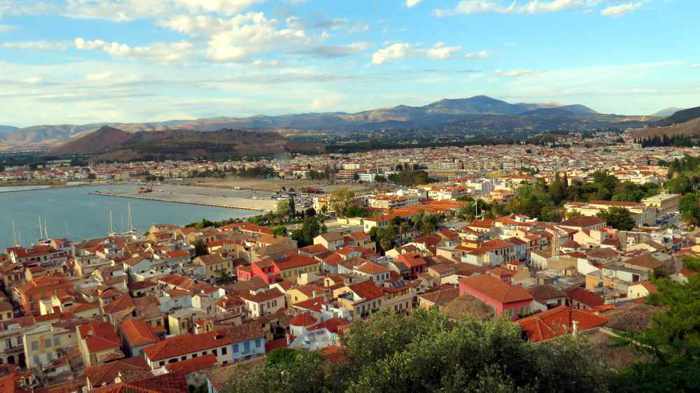 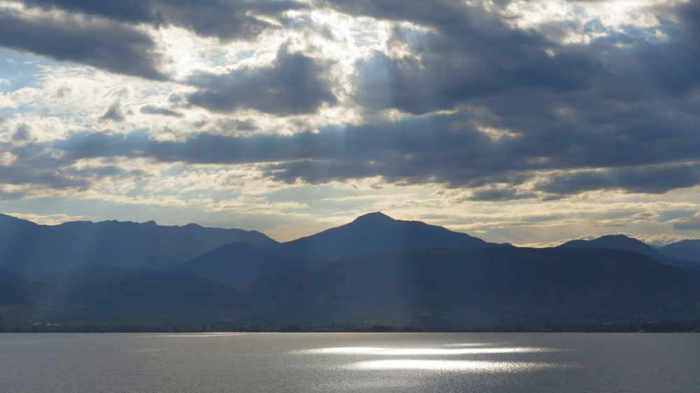 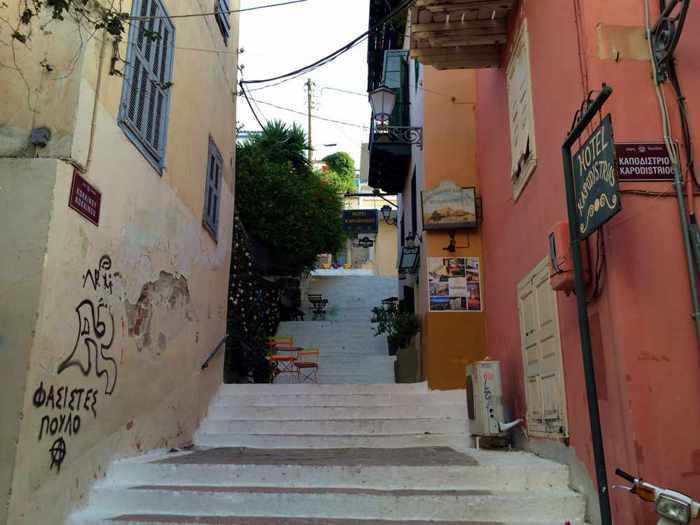 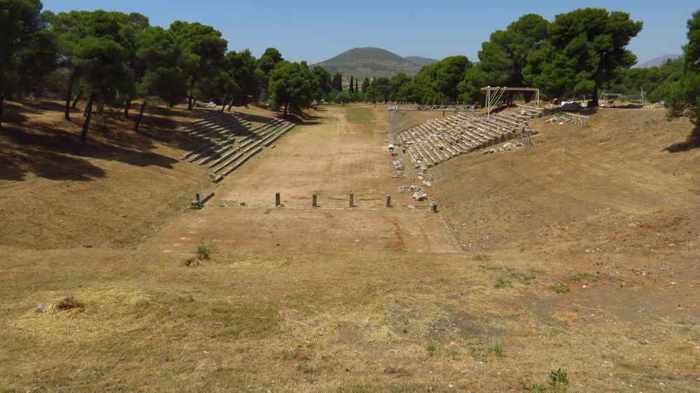 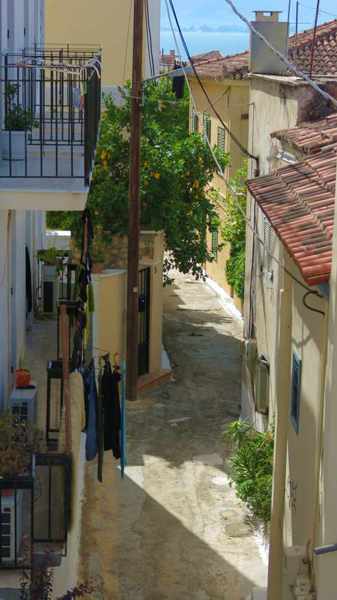 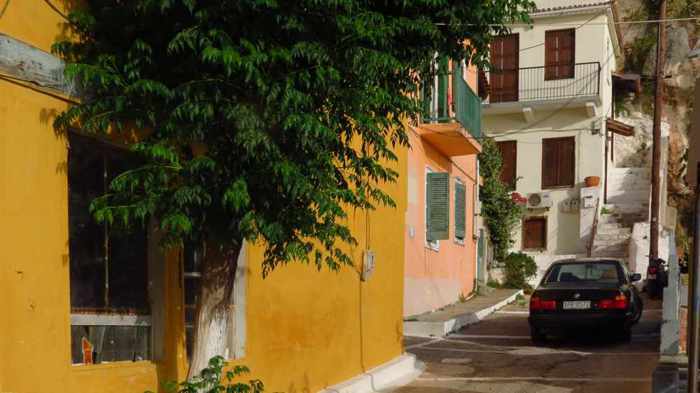 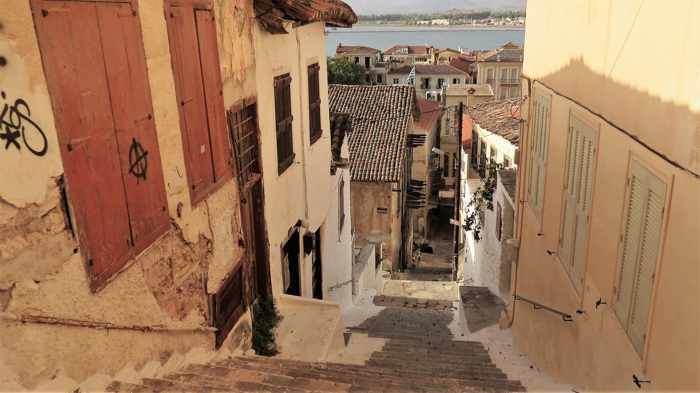 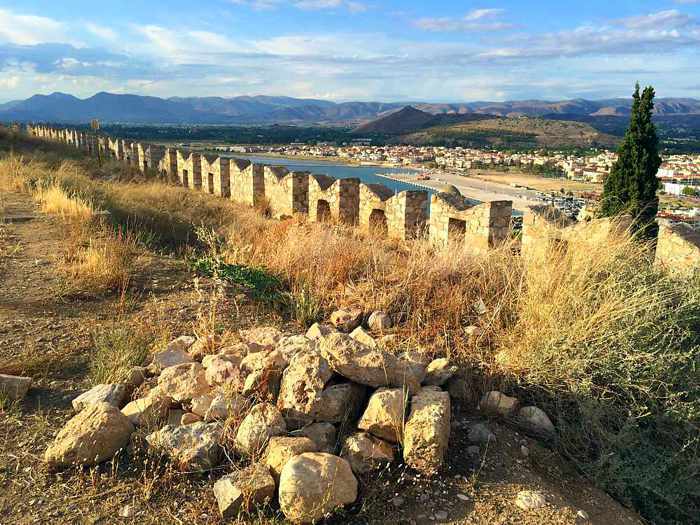 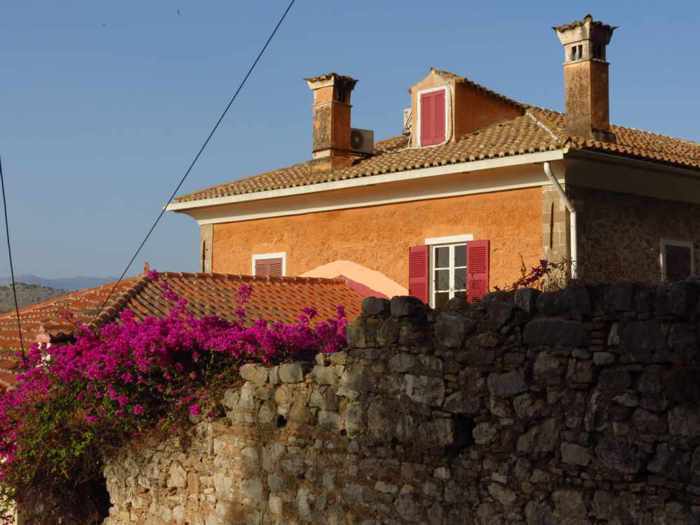 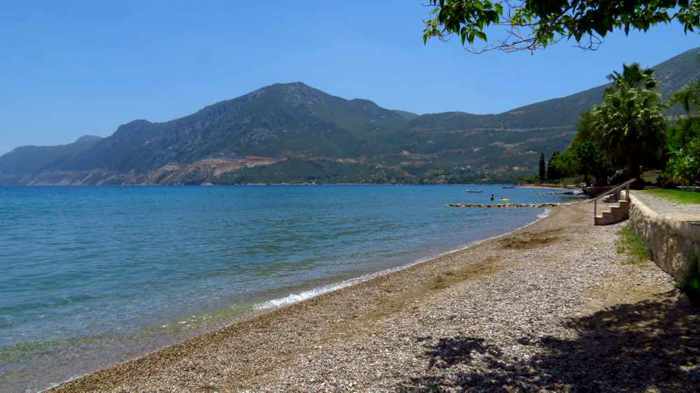 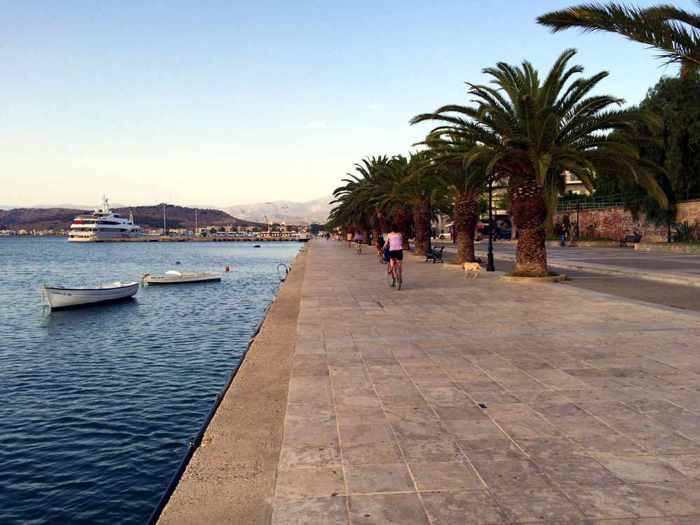 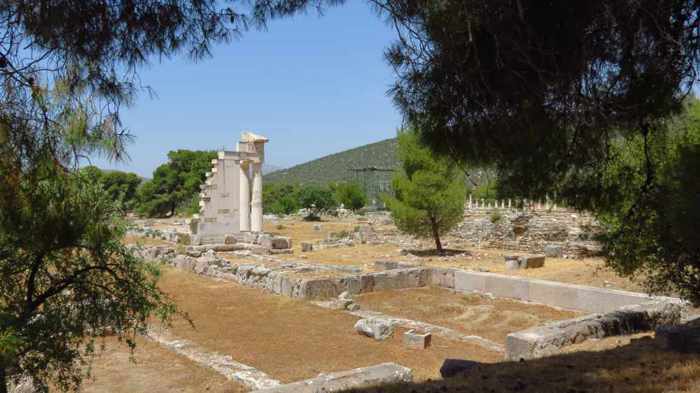 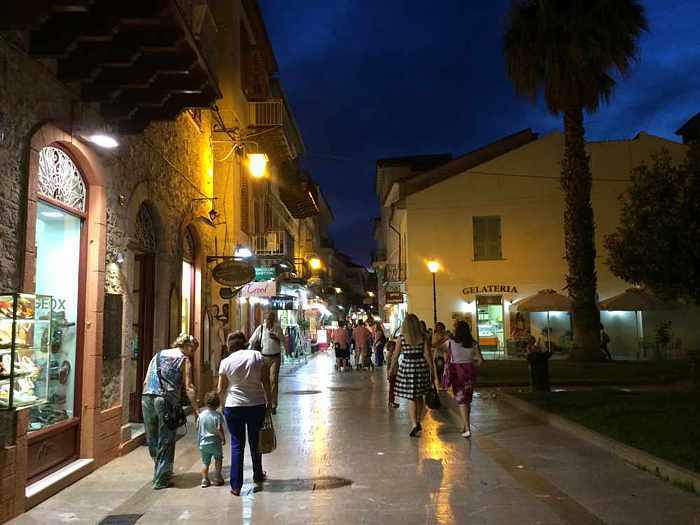 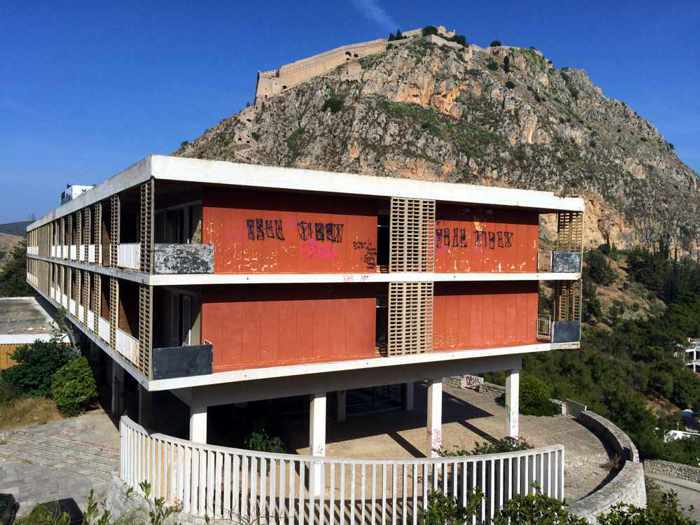 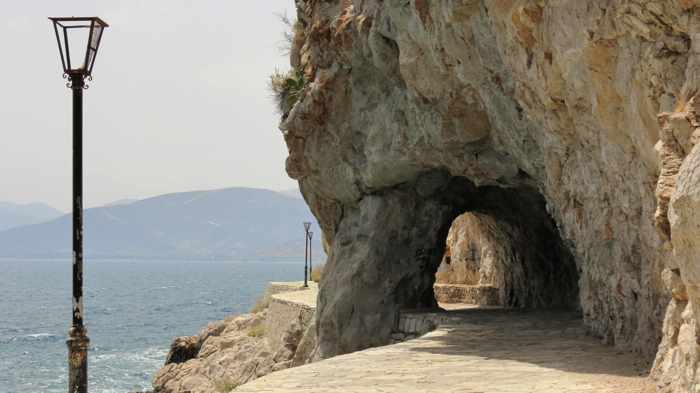 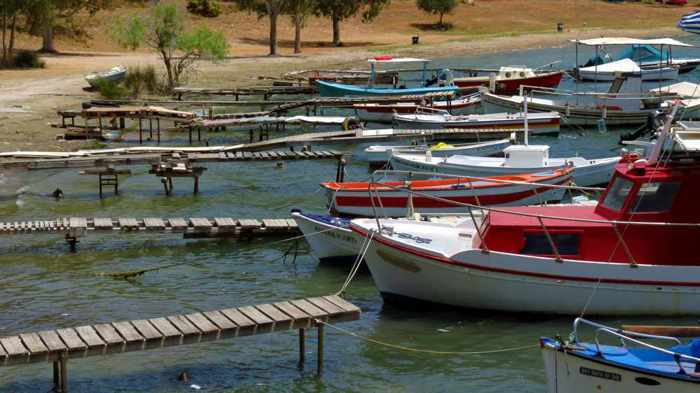 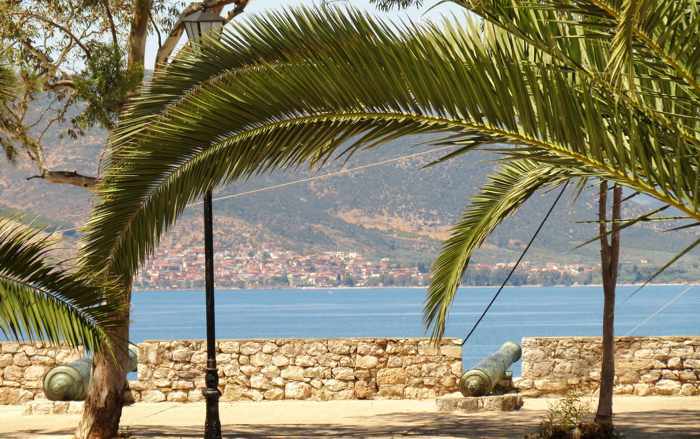 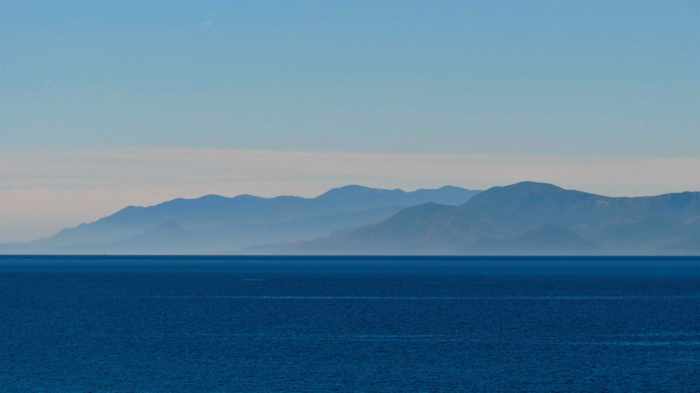 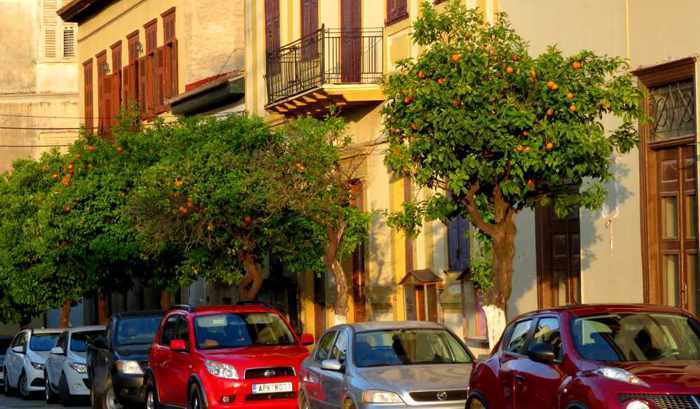 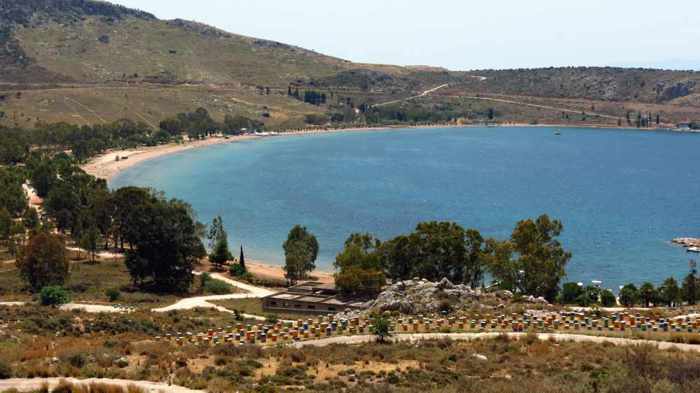 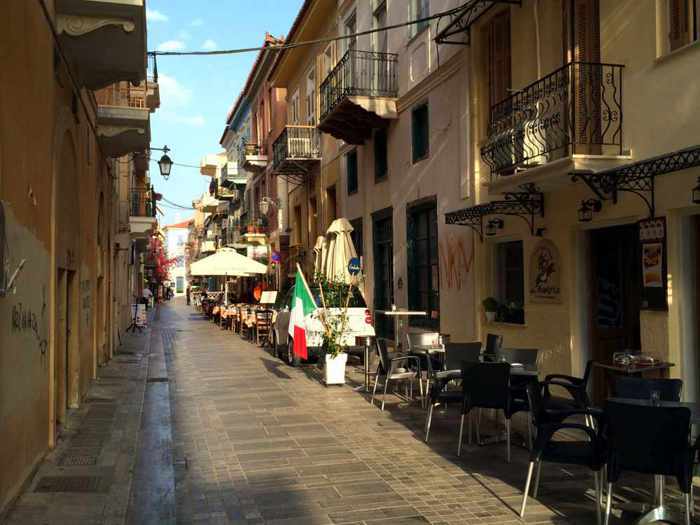 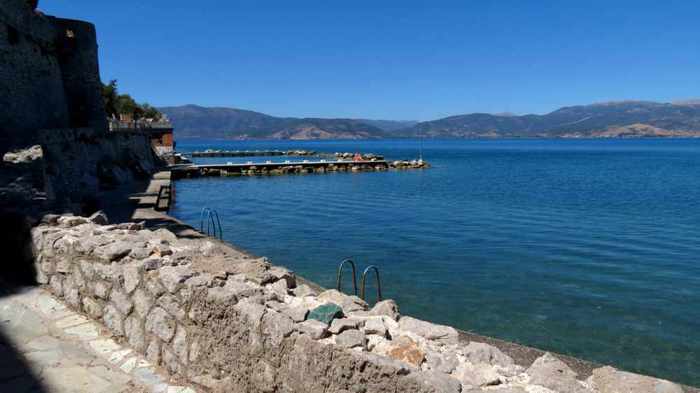 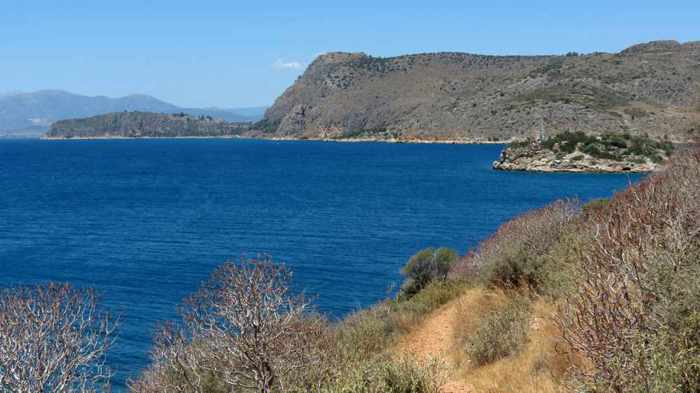 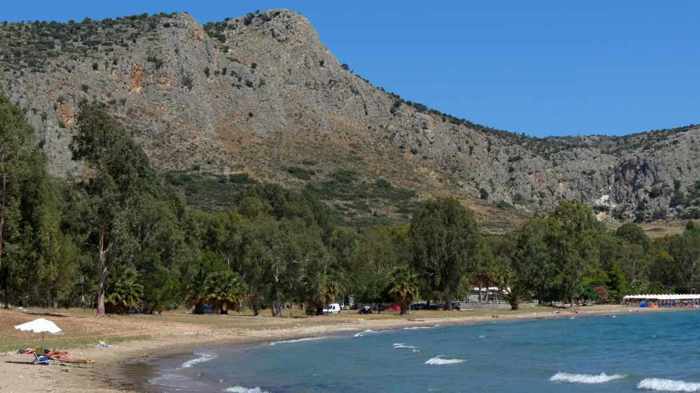 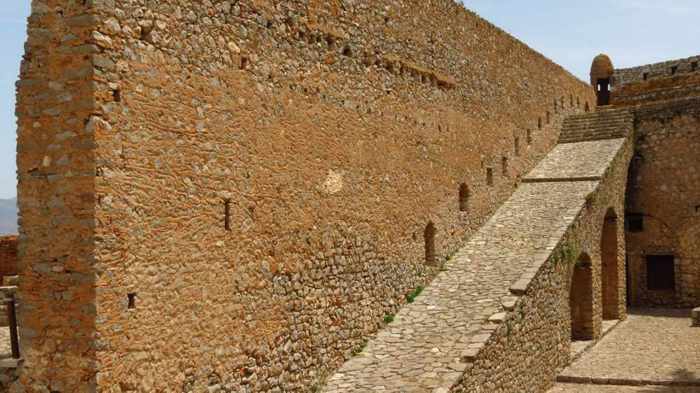 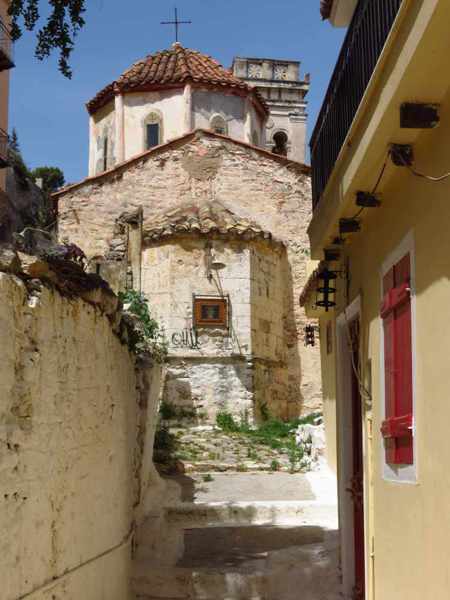 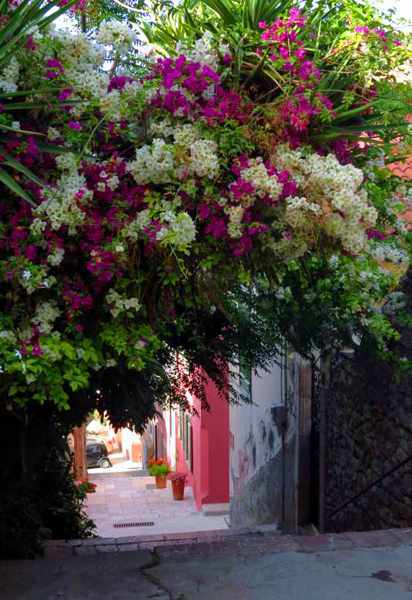 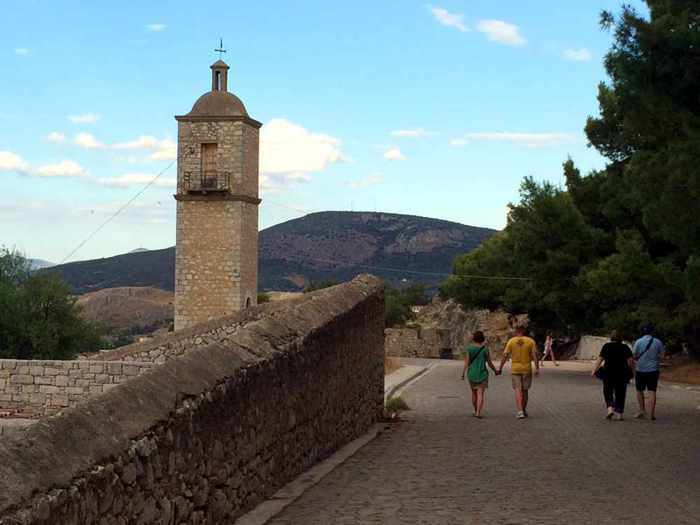 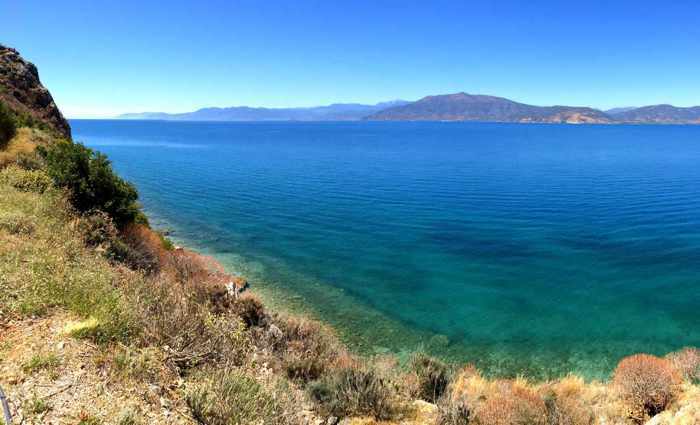 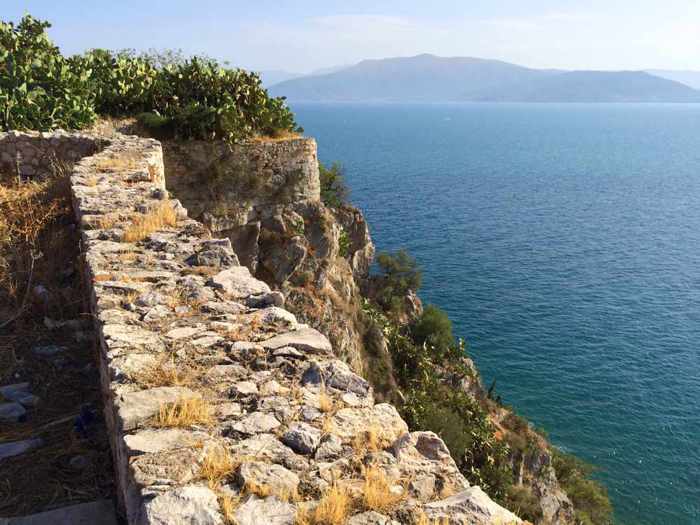 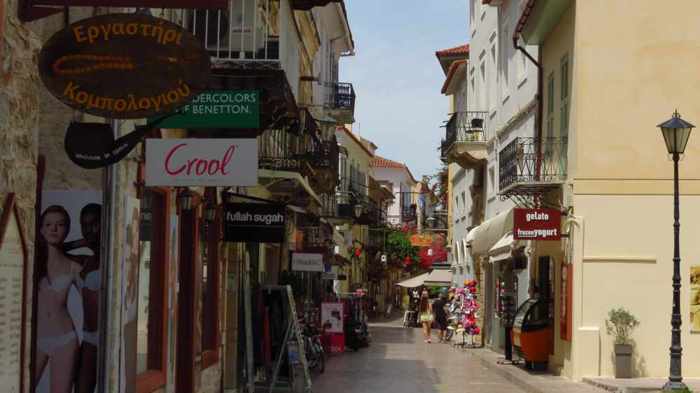 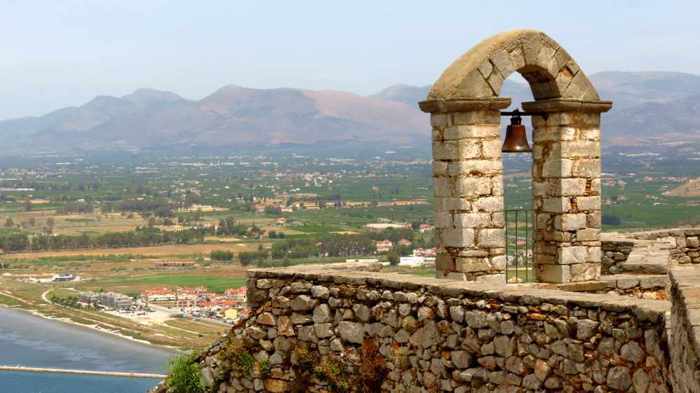 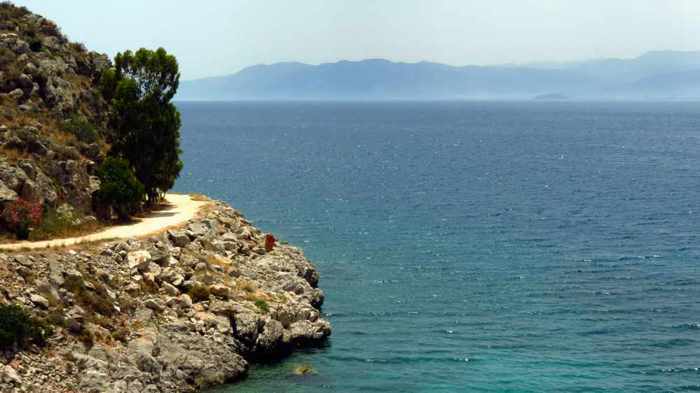 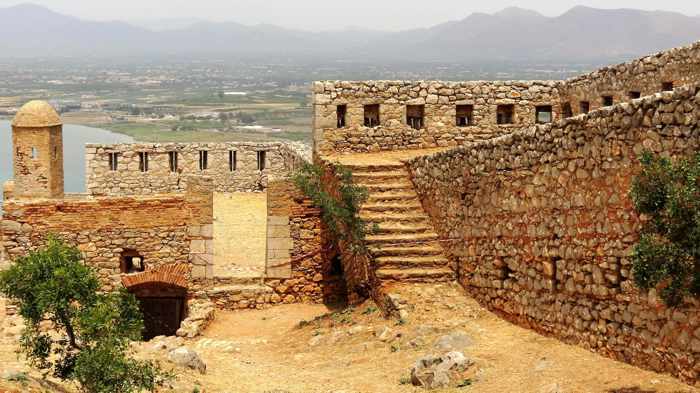 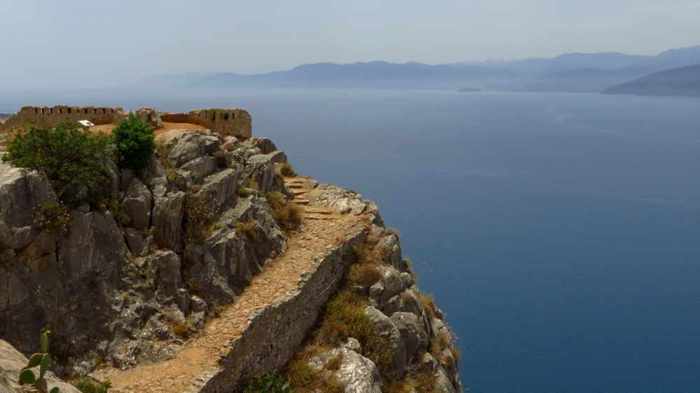 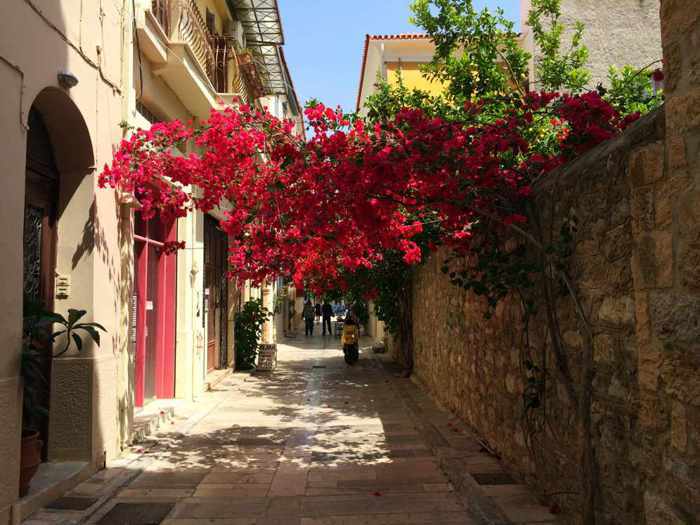 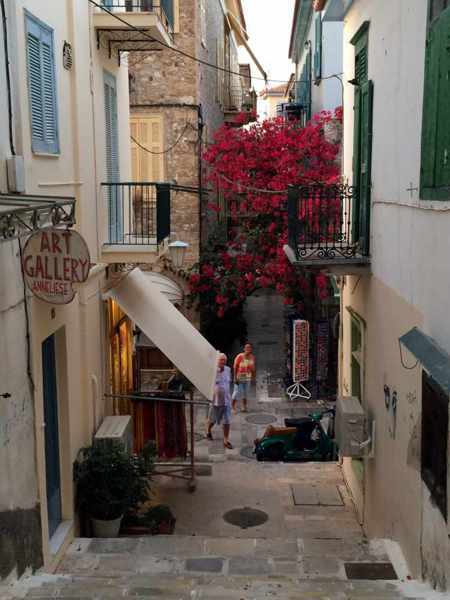 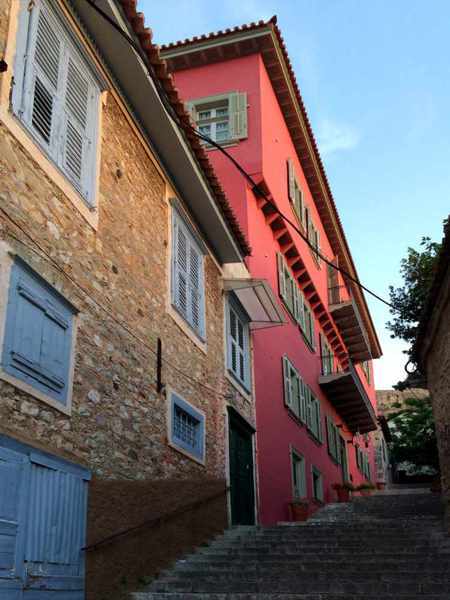 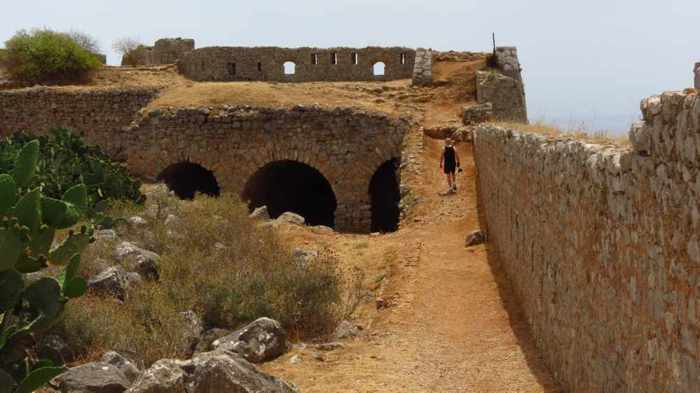 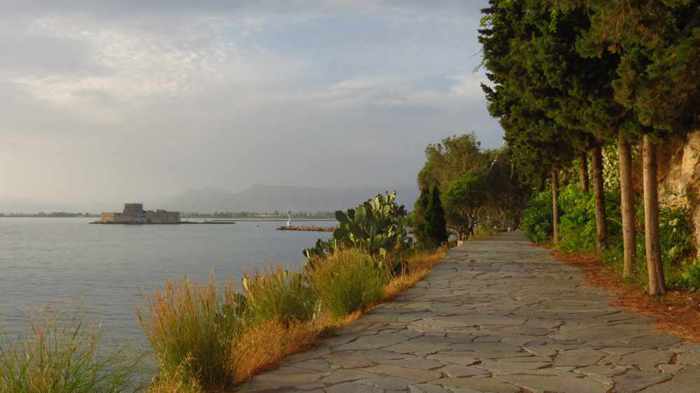 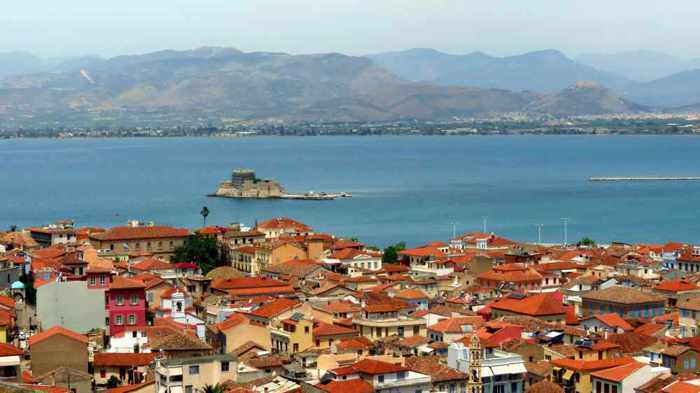 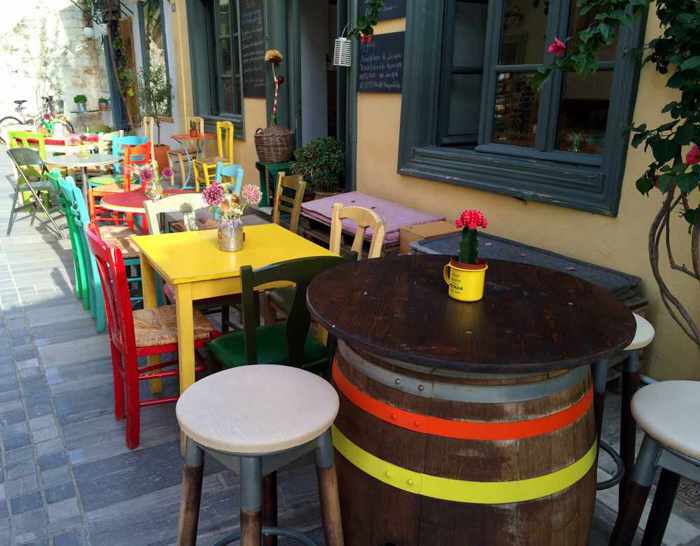 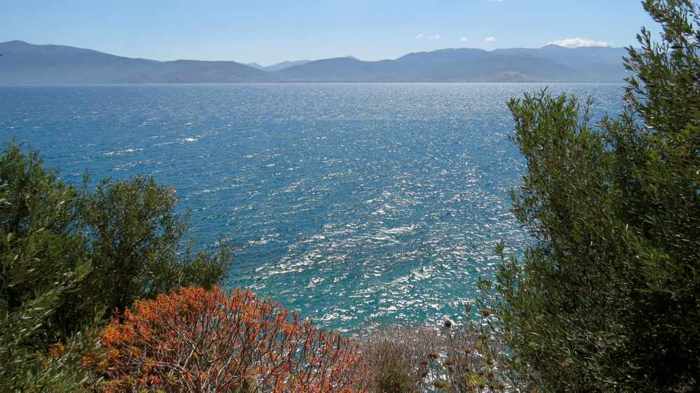 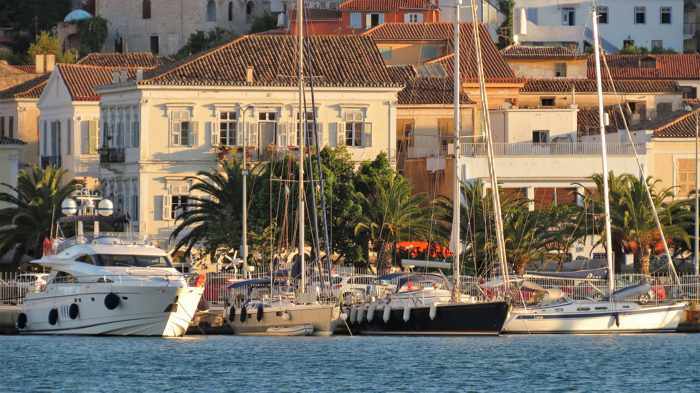 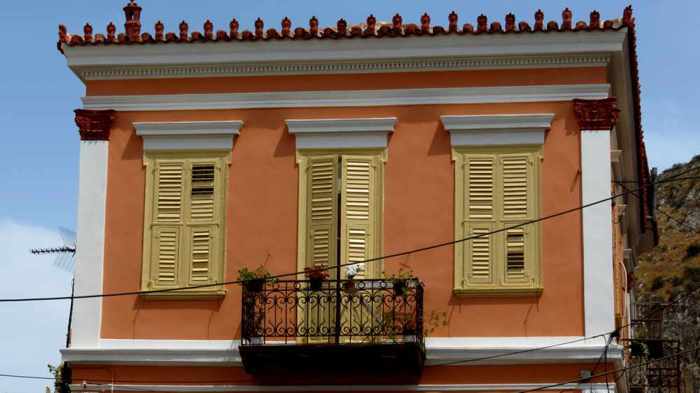 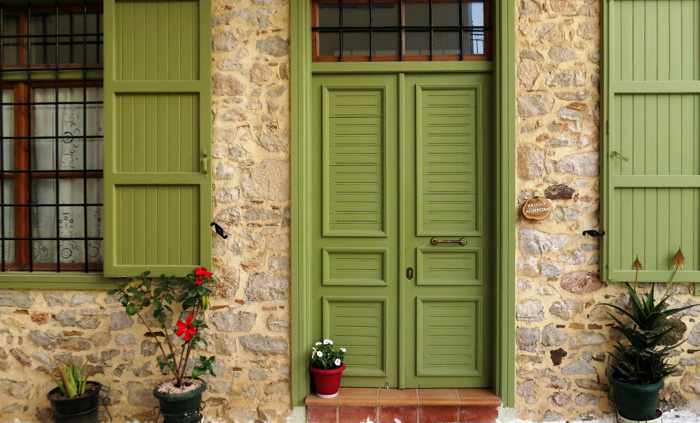 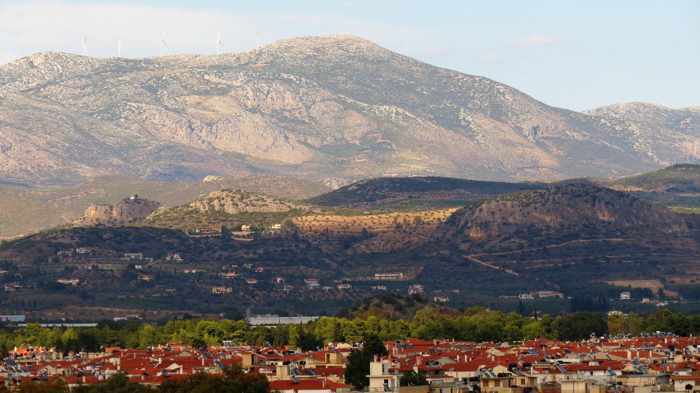 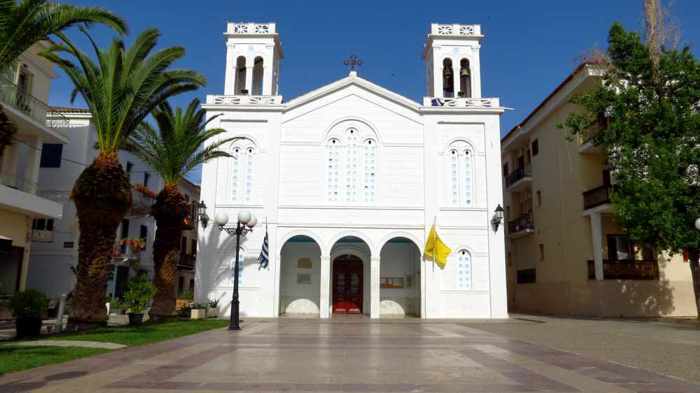 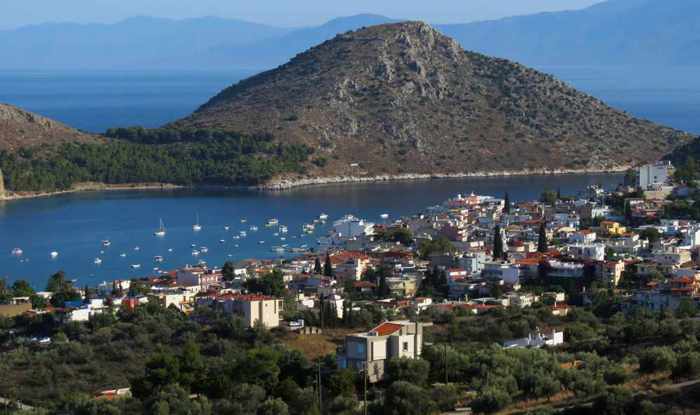 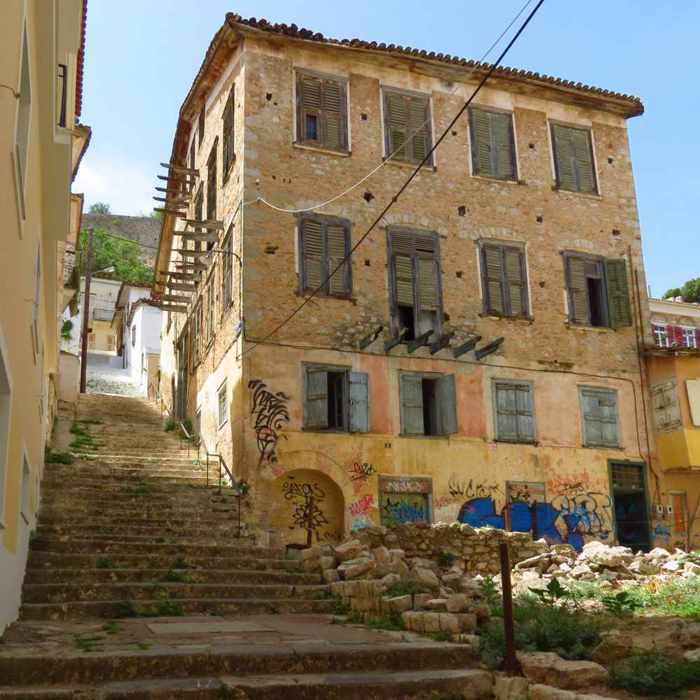 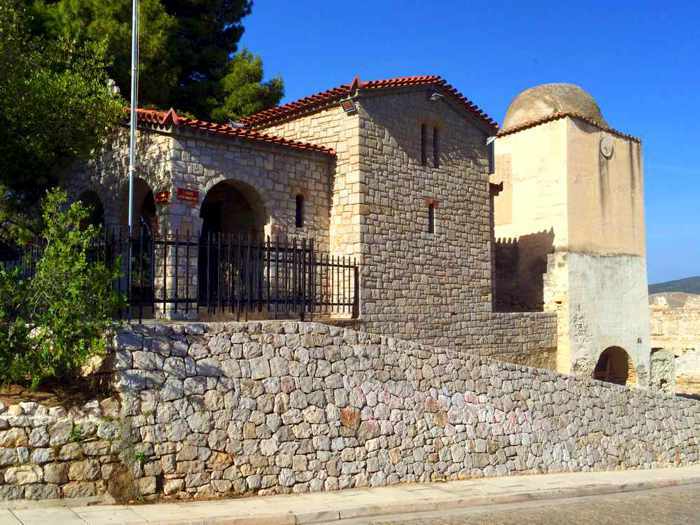 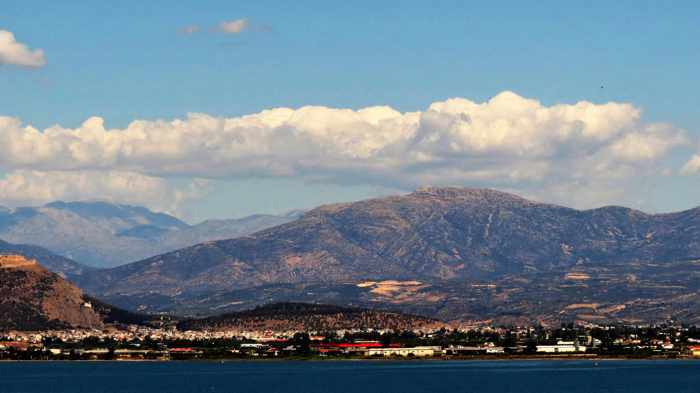 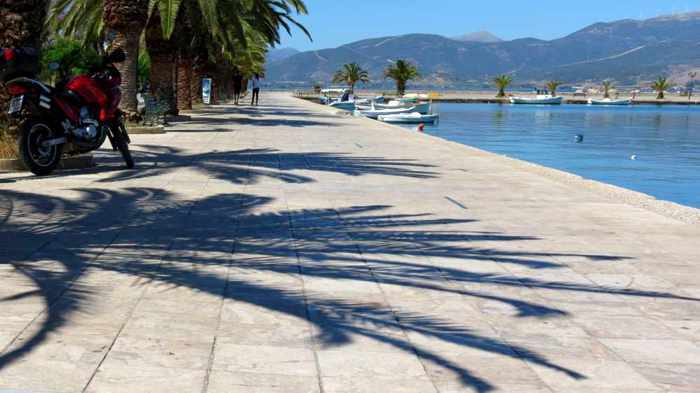 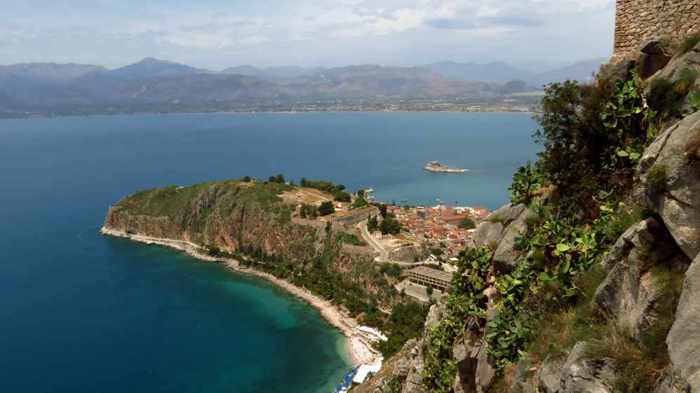 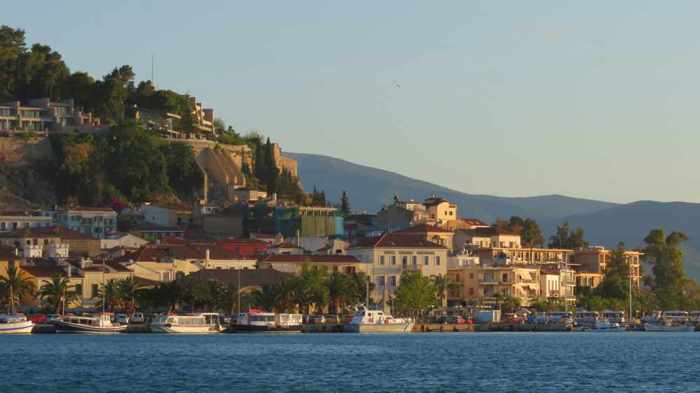 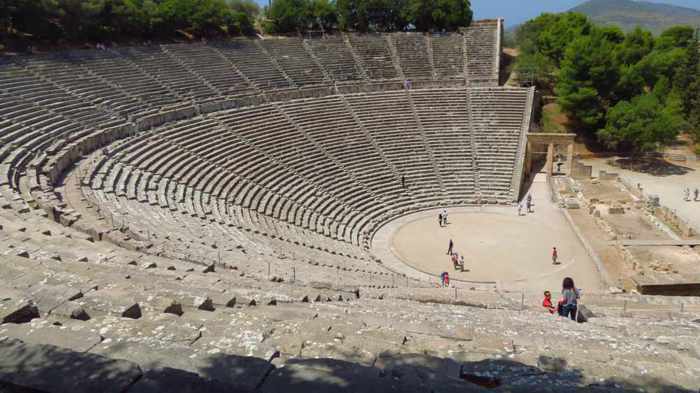 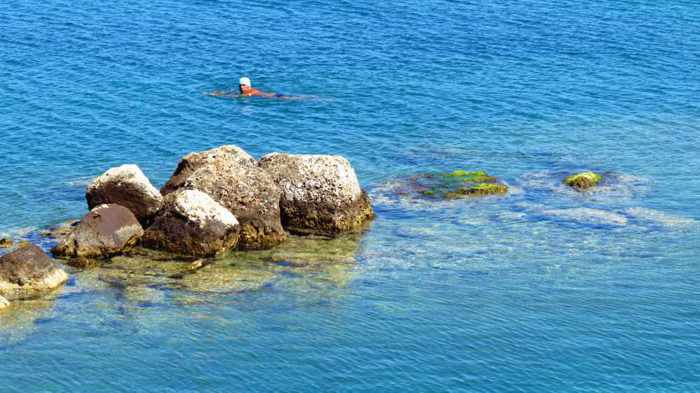 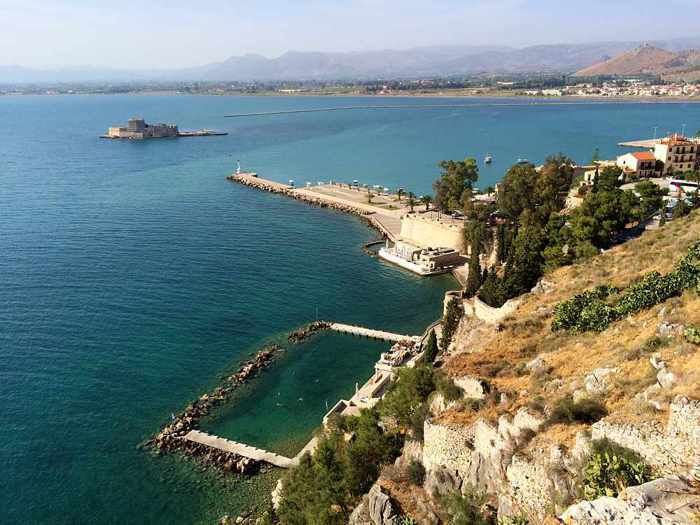 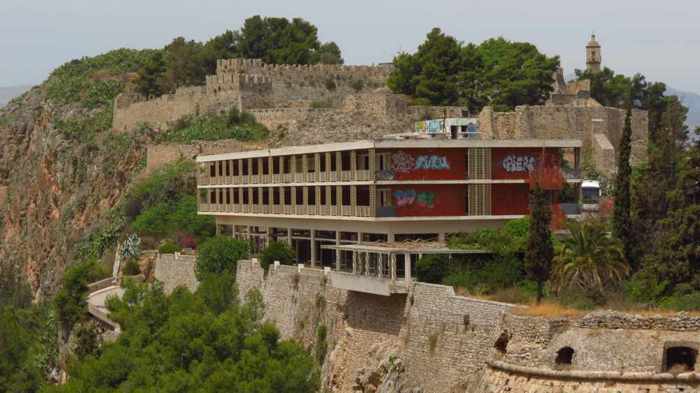 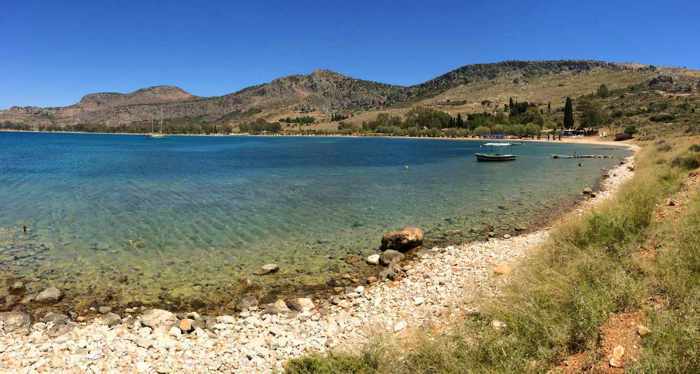 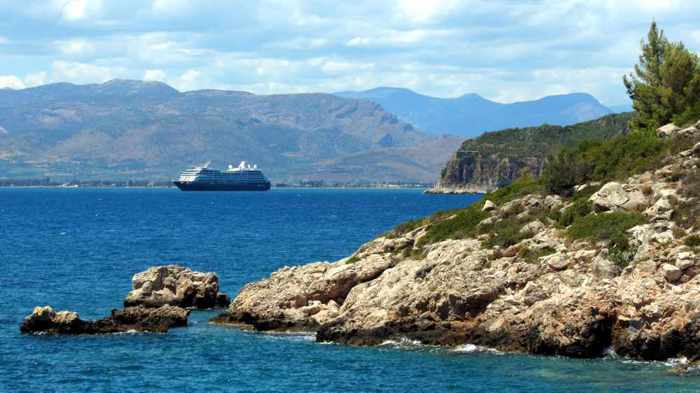 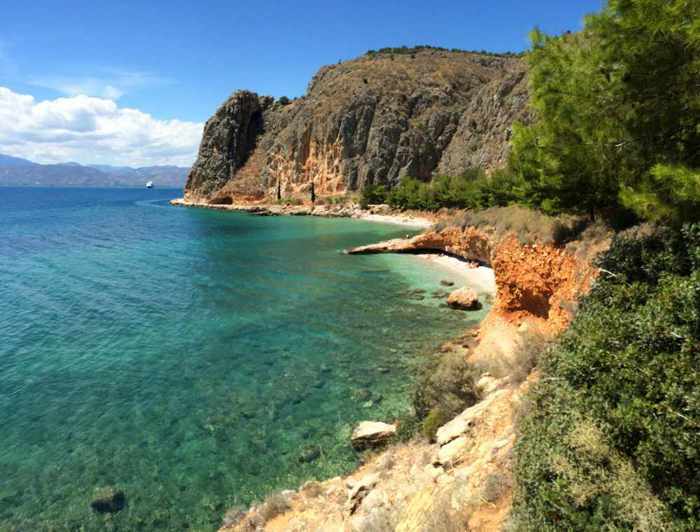 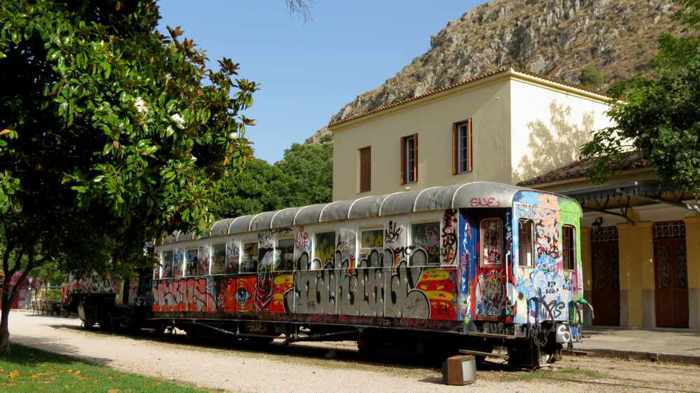 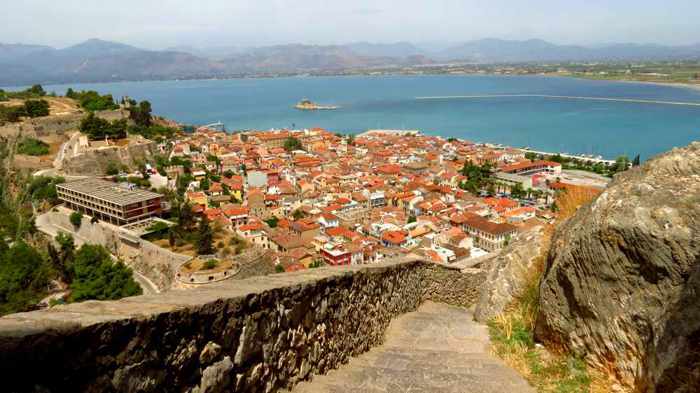 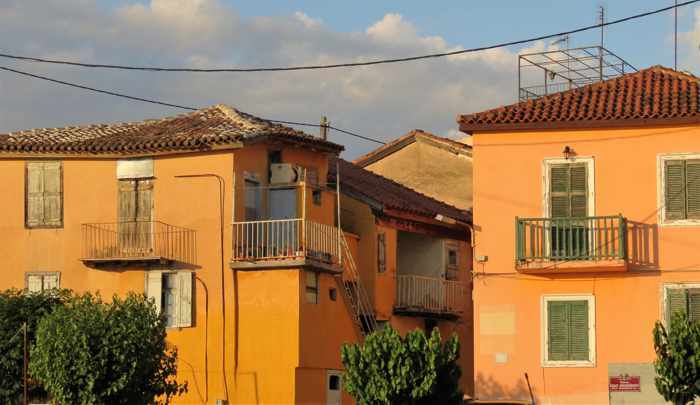 We could have taken daytrips to other historic archaeological sites nearby, including Mycenae and Tiryns, but we have left those for our next trip to Nafplio. 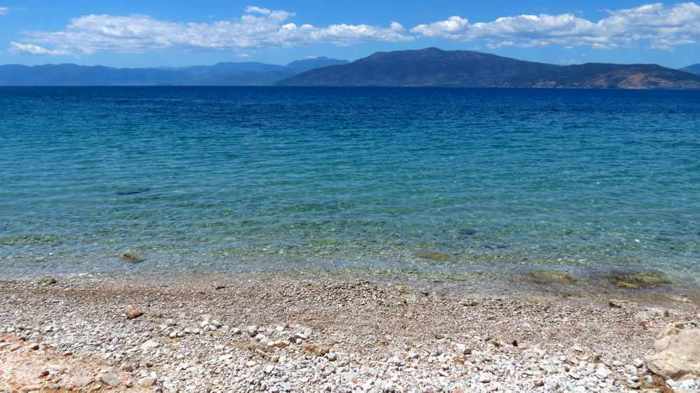 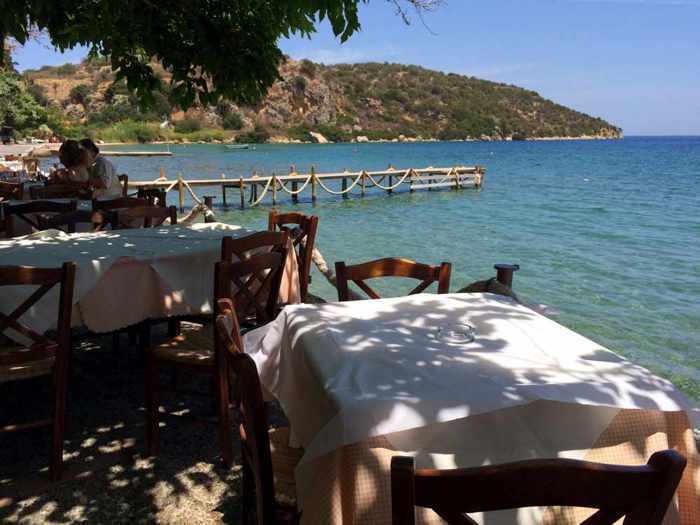 After visiting Epidaurus , we drove to Arcaia Epidaurus to have a nice long lunch break by the seaside at Mouria Taverna . 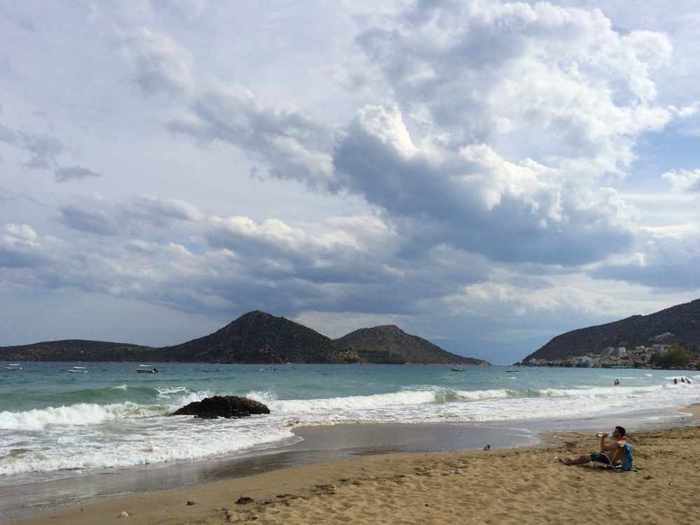 This was the panoramic view from our table. 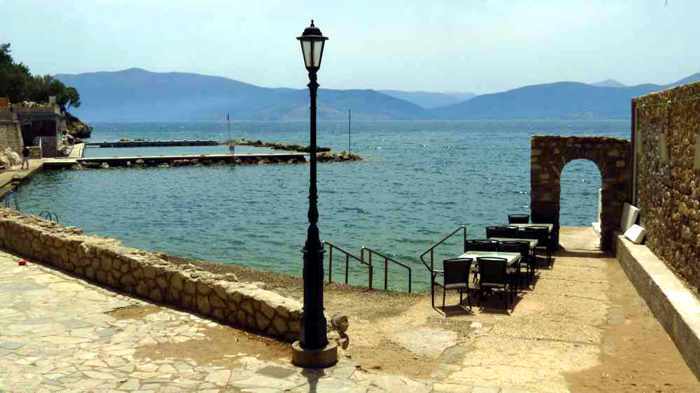 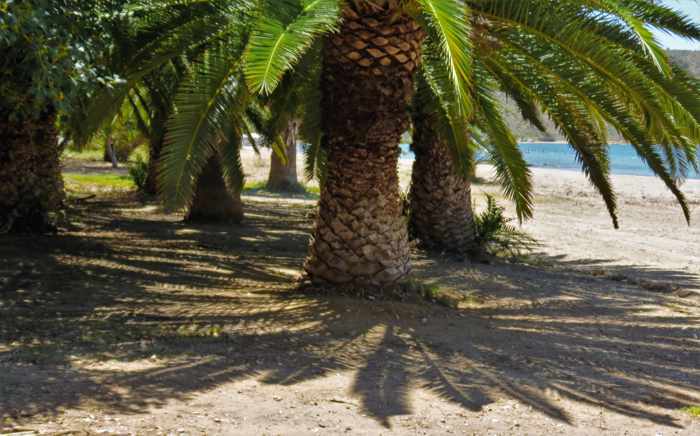 The beachfront at Mouria Taverna. 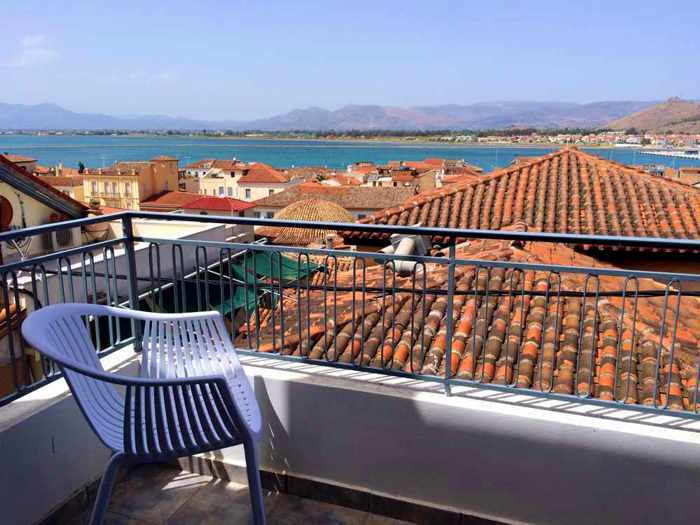 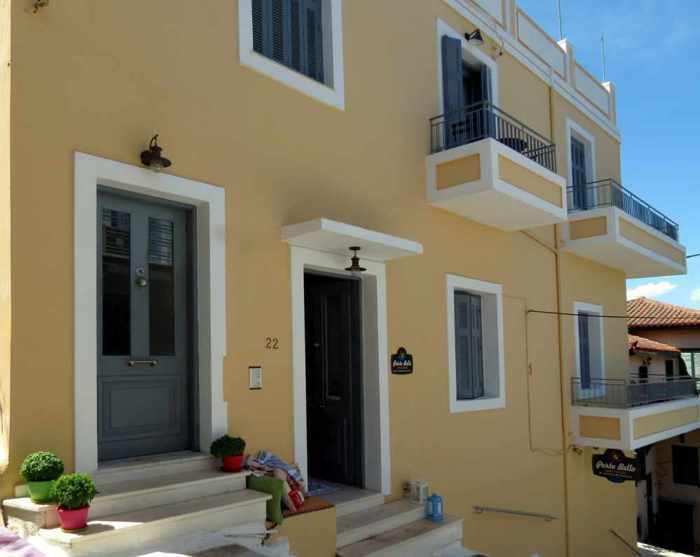 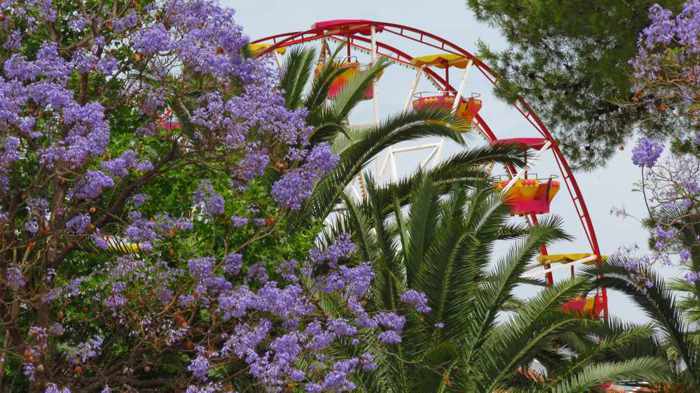 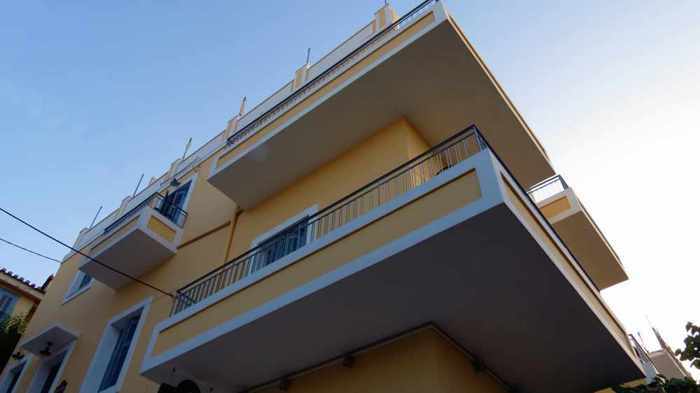 Accommodations are available both at Mouria and close by. 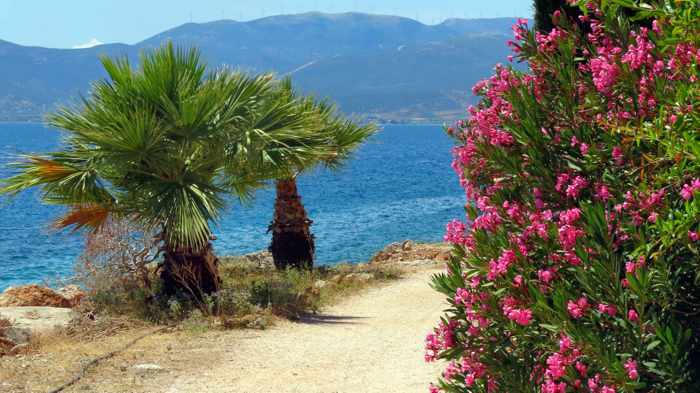 It’s a beautiful and peaceful seaside area. 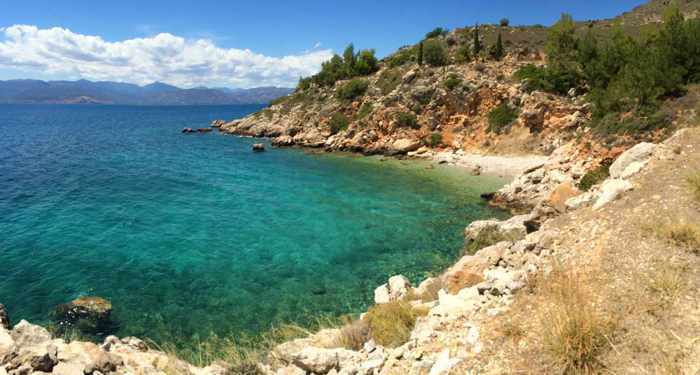 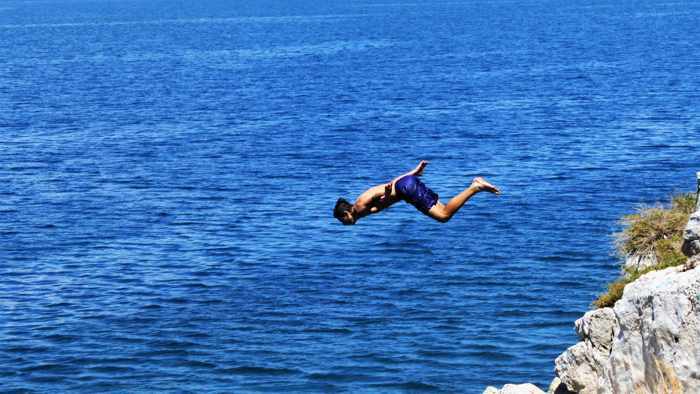 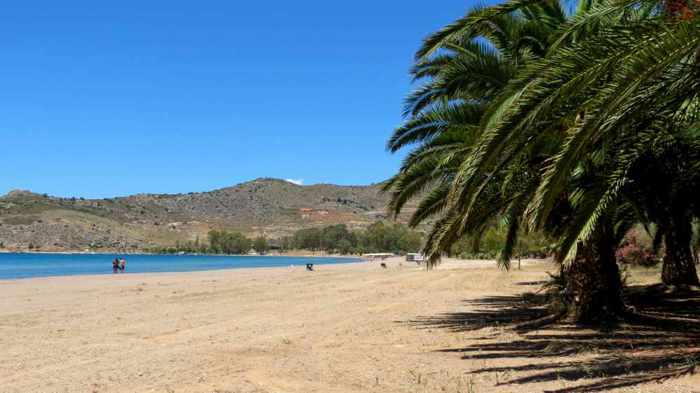 Tolo boasts a gorgeous golden sand beach with shallow turquoise water. 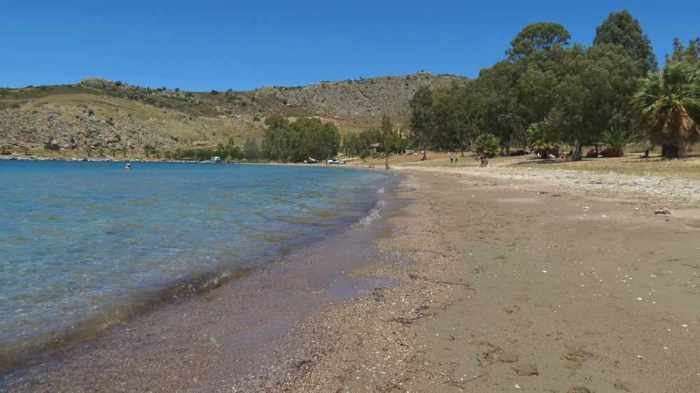 Several more beaches are within walking distance of this one.